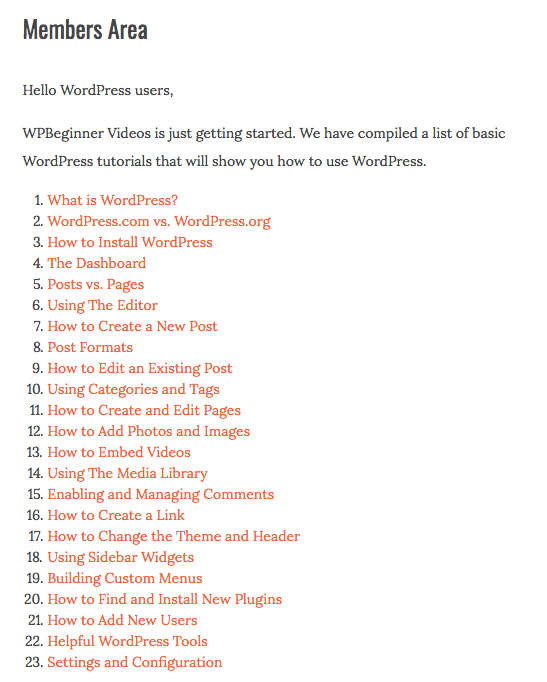 All you need to know about WordPress as a user. A WordCamp does not end until you write about it in your blog. I’m pretty sure that if you attended a WordCamp recently you have heard this sentence at the end of the event. A few days ago I came back home from WordCamp Nordic 2019, so now is the perfect moment to tell you about my impressions of the event. Let’s do it! This was the first edition of WordCamp Nordic 2019, which represented the Nordic countries of Denmark 🇩🇰, Finland 🇫🇮, Iceland 🇮🇸, Norway 🇳🇴 and Sweden 🇸🇪. If it is already difficult to organize a WordCamp locally in your city, just imagine all the efforts it takes to prepare a WordCamp organized by several countries! Luckily for us, it was a total success. WordCamp Nordic took place on the 7th and 8th of March, 2019 in Helsinki, Finland. As each Nordic country has its own language, the organizers decided to use English as the common language. This, in turn, increased the number of attendees from other parts of the globe. For me, the event became a kind of prequel to what we’ll see in June at WordCamp Europe in Berlin. The event began on March 7th at the campus of Aalto University, in the town of Espoo, just half an hour from downtown Helsinki by Metro. Google Maps took me without problems to the main door of the building where Contributor Day was held. Of course, getting there was quite an adventure due to the amount of snow. Coming from Barcelona, where you could already find people basking on the beach, this was quite a change! Getting to WordCamp Nordic’s Contributor Day was a real adventure for a Spaniard. I love Nordic countries and cold climates, so I had no problem with the weather. Besides, I was well equipped with good warm clothes and good boots 😉. 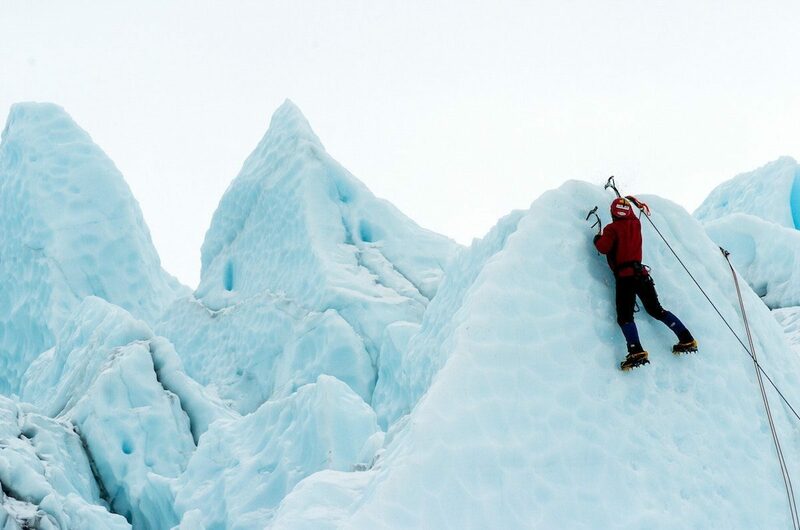 I enjoyed the landscapes and the snow as if I were a child! 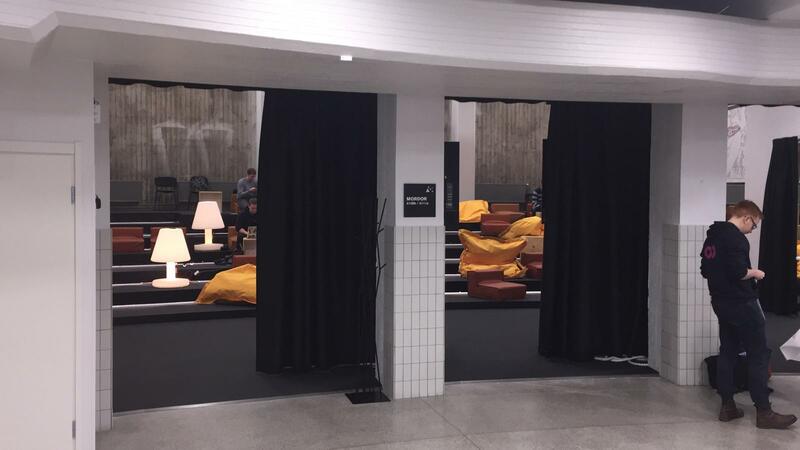 Mordor room, where I was participating in the Contributor Day of WordCamp Nordic 2019. Much has been said about starting a WordCamp with a Contributor Day instead of the day of presentations. Personally, I like to start with the Contributor Day because it gives people time to get to know each other in advance. This time I was collaborating in the Documentation group, together with Milana and Marius and the rest of the team (sorry for not remembering all the names). 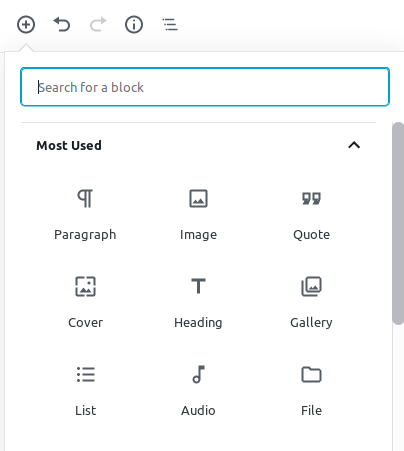 I was able to participate in the preparation of the user documentation of the new block editor for WordPress, so everything we did was quite useful for WordPress users. There was also an event for children during the Contributor Day. Directed by Petya Raykovska, its goal was to introduce children to the WordPress world. Everyone ended up learning a lot and with a website created. Such a great idea! In addition to spending the morning contributing, at lunchtime I was able to have an interesting talk with Rocío and Francesca Marano about many different topics. It was a pleasure to spend that time with them. And thanks again to Rocío for introducing me to Andrea Middleton, WordPress Community Organizer, with whom I was able to talk about several topics on which I am working with the Attendee Services team of WordCamp Europe of 2019 (something we’ll cover in future posts). All in all, the summary of my Contributor Day is that I spent half of the day contributing and the other half talking to interesting people. Now I’m looking forward to WordCamp Europe! Piccia Neri explained why user experience is that important today, at all levels, in her talk about UX for Everyone. Marco Fernandes and Thor Andre Gretland showed us the Gutenberg Cloud project, a repository of online blocks independent of the content management system you are using. I enjoyed Julius Haukkasalo’s talk about the mistakes to avoid being an entrepreneur. This kind of talk is necessary and I love seeing people explaining their mistakes raw. 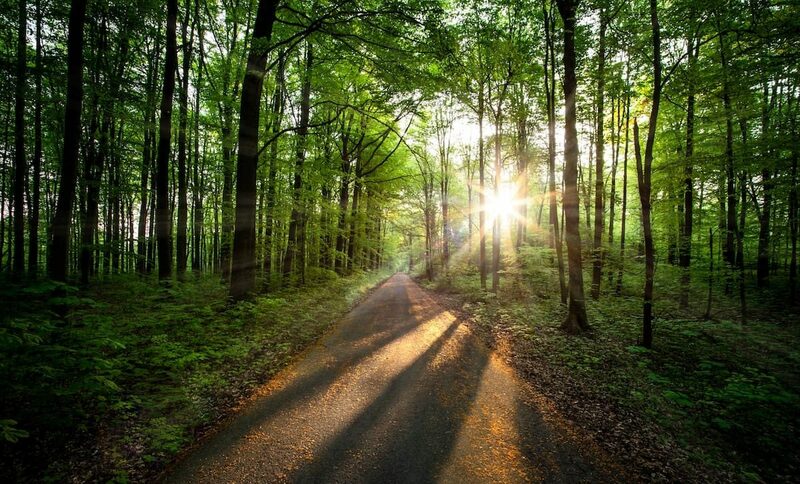 You learn a lot more than if they tell you only the beautiful part of the story. After lunch I attended the talk by Francesca, who explained how the Italian WordPress community has grown. Undoubtedly, they are real candidates to be the next city host of WordCamp Europe. The talk by Thomas Hurd on multilingual sites was also interesting. It made me see things that sometimes go unnoticed, like for example that it is better to use text instead of flags to indicate the buttons for switching the language in a web. Taeke Reijenga explained the importance of accessibility. Thanks to it I discovered that there are places where organizations are already being sued if their websites are not accessible. Finally, Monica Solheim Slind and Magne Ilsaas explained how they have adapted their businesses to meet the needs of their clients and the Norwegian government, with which they work. It was a very interesting talk. The very first #WCNordic is a wrap and our team really had a blast! Kudos to the organizers, volunteers, speakers and other sponsors. We hope the success story will continue in 2020! The scarf all the attendees got was really useful. The weather in Helsinki in March can be very hard with really low temperatures compared to Spain. My opinion about the event is very positive. The organizing team took care of everything to make the best event possible. And I really appreciated it. The Contributor Day was great. And the day of presentations was also well managed. There were lots of attendees, even for a Friday. For me it was a wise choice of dates, because that allowed us to have the weekend off to be able to do some sightseeing in Helsinki. Attendees at WordCamp Nordic 2019. If you have ever been organizing events like this, you will already know how difficult it is to make sure everything works as expected. In the case of WordCamp Nordic, everything was perfect and I can’t say anything negative about it. What a pleasure to see a well-integrated team of organizers working together! In short, a round of applause for all those who made this event a reality. Surely it fulfills its mission to give a boost to the WordPress community in Northern Europe. See you again in Berlin! 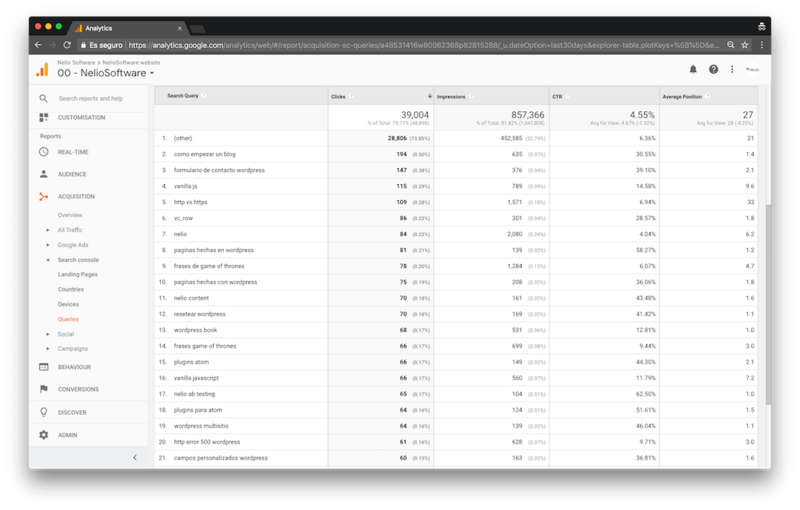 We start this New Year 2019 talking about the growth and usage statistics of WordPress. Knowing this information can help you to decide on which system to built your website or even convince a customer or your designer the time has come to renew your website. Do you have any idea how many domains and websites there are on the Internet? Difficult, isn’t it? But before talking about these numbers, it is better to clarify the differences between the concepts of domain name, URL, and website. A domain name is the online address that your customers type when they want to find your business. It is the neliosoftware.com of the URL you see written in the address bar of this page. 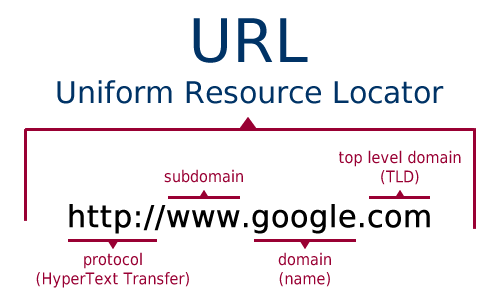 A URL is what you find in the address bar of any web page. It is the universal locator of any page. 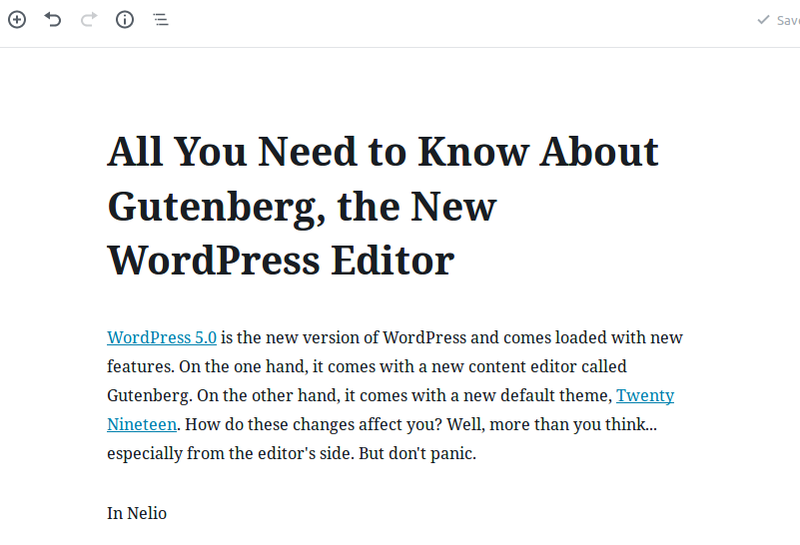 In the case of this page it is https://neliosoftware.com/blog/curiosities-and-statistics-about-wordpress-you-should-know/. As you can see, it includes the domain name. Finally, when we refer to a website we mean to one or a set of related web pages that include multimedia content. A website can be publicly accessible over the internet or privately on a local network. Now let’s go back to the figures that interest us about the number of websites, URLs, or domains that exist… unfortunately, there is no single official record that gives us this information. The information that’s probably closer to reality is provided by Netcraft and Internet Live Stats. According to these, there are more than 1.9 billion websites in the world. 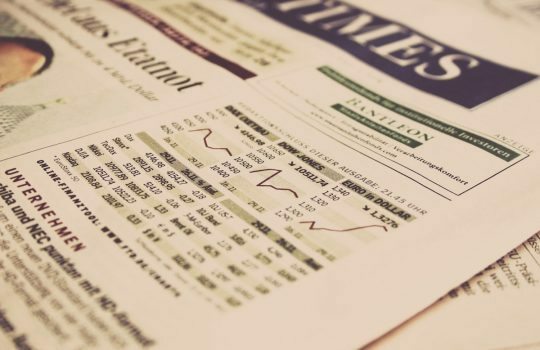 And according to Verisign, who is dedicated to reviewing the state of the domain name industry through various statistical and analytical research, we ended 2018 with more than 350 million domain registrations of all top-level domains (TLDs). And why is there such an abysmal difference between these two figures? For the simple reason that there are many domains that are divided into subdomains that correspond to different websites. For example, from the domain wordpress.com we have a lot of webs, such as https://pildorasdecomunicacion.wordpress.com/, https://lagottocattleya.wordpress.com/, https://worddreams.wordpress.com/ etc. Now that we have an estimate of the total number of websites in the world as a point of reference, let’s see how many of them use a CMS (Content Management System). In case you are not familiar with what it is, a CMS is a system that is installed on a server (usually that of a hosting company) and generates web pages when any Internet user requests them, and can even generate dynamic content depending on the user. It has a public part that all Internet users see and a private section or control panel. It is through the control panel where the owner of the website can change the content without having programming knowledge. According to W3Techs, 54.5% of websites use a CMS versus 45.5%, which uses none at all. As you can see, more than half of the websites use some kind of content manager. 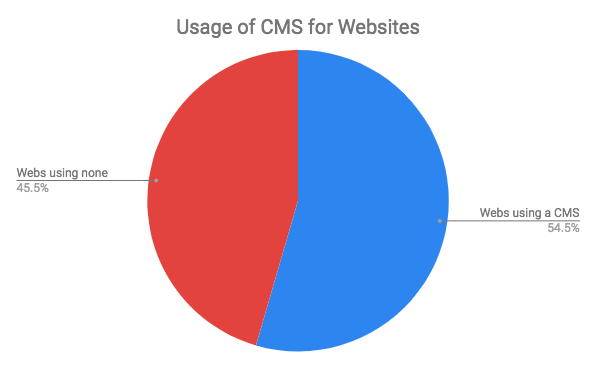 Usage of CMS for Websites (source: data extracted from W3Techs ). But of the 54.5% of websites that do use some kind of CMS, 59.5% use WordPress, which is equivalent to 32.5% of all websites. 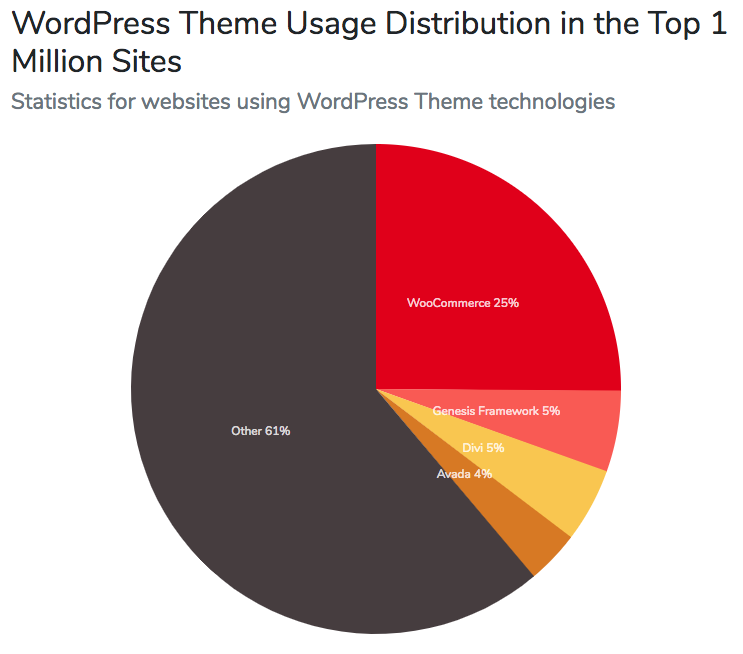 Image from W3Tech about the WordPress usage. 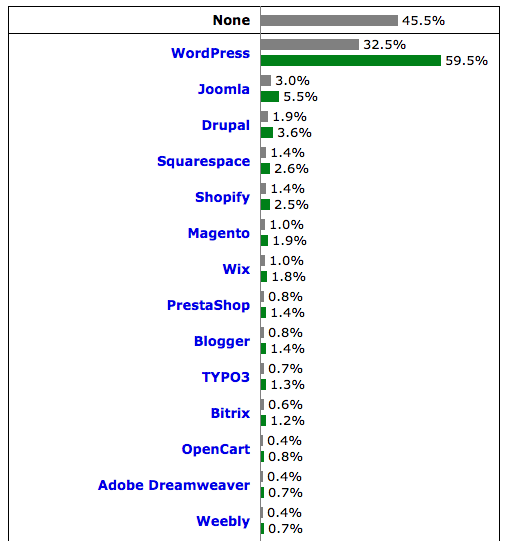 In other words, of all the websites, 32.5% are WordPress. So, assuming that, as we’ve already found out, 1.9 billion sites of which 32.5% are WordPress, we deduct that there are 617.5 million WordPress sites in the world. 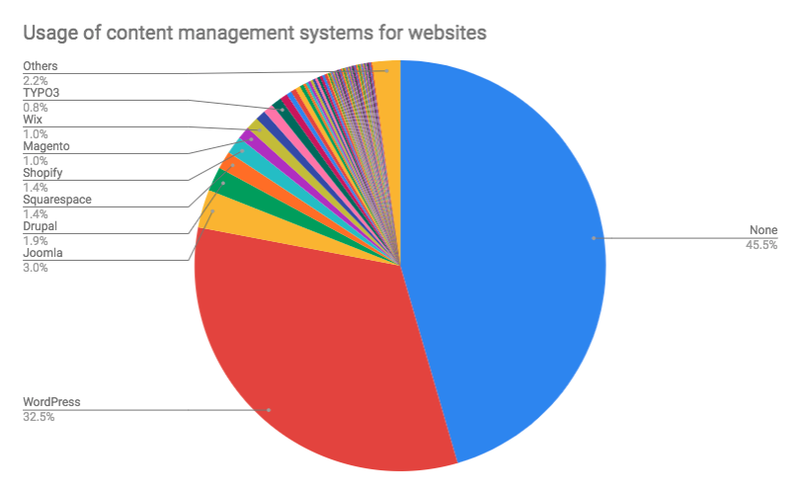 And in fact these figures are not so far from those given by BuiltWith.com in which they have analyzed 1 million of the best websites that use a CMS, of which 53% are WordPress (below 59.5% of W3Tech). 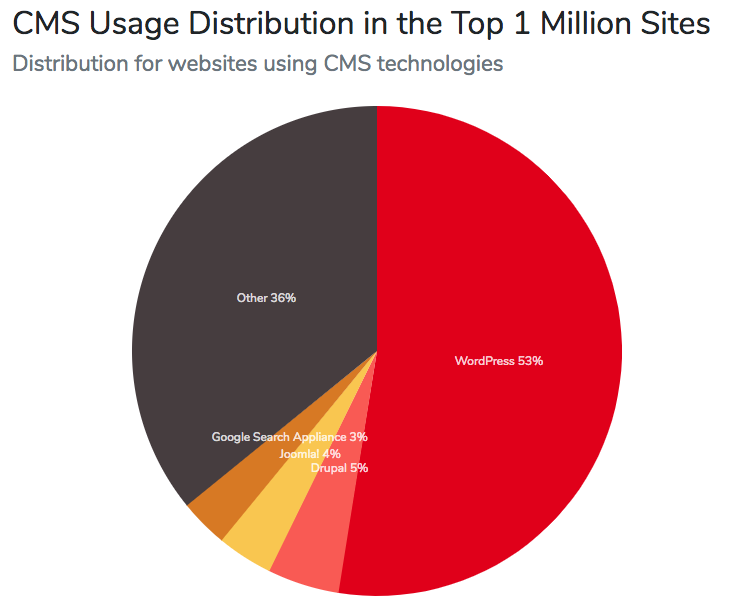 Which CMS uses the one million best websites with any CMS? (Image from builtwith.com). Seeing the relevance of the use of WordPress in the market, let’s now look at relevant information about it and the activity around WordPress. But let’s get on with interesting figures. 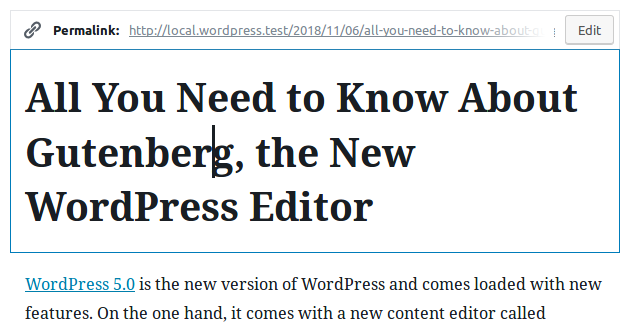 As WordPress is a community in which we all contribute to its development and maintenance, promote its use, and sponsor events where we talk about it, this has allowed Matt Mullenweg to own one of the most profitable technology company. It’s impressive to see the ratio of revenue per number of Automattic employees, isn’t it? 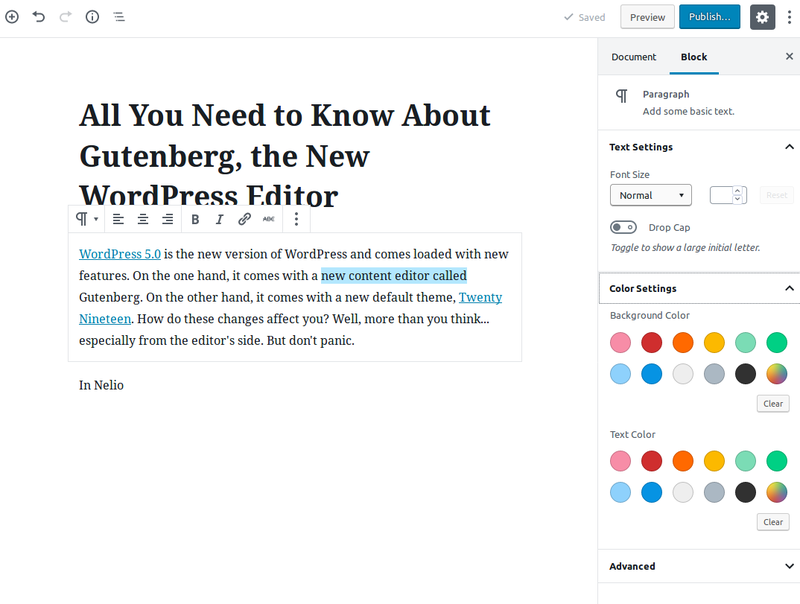 (Source: Automattic). 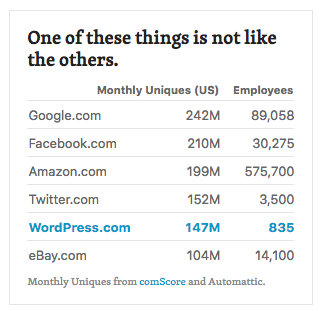 Some other WordPress.com figures: about 409 million people see more than 21.2 billion pages each month. And there are more than 69.3 million new posts and more than 72 million comments every month. 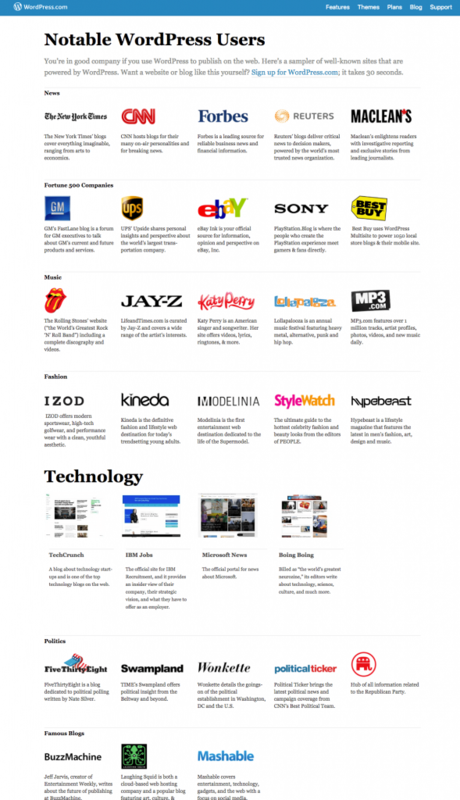 You can also take a look at some of the most prominent WordPress users. Notable WordPress Users (source: WordPress.com). 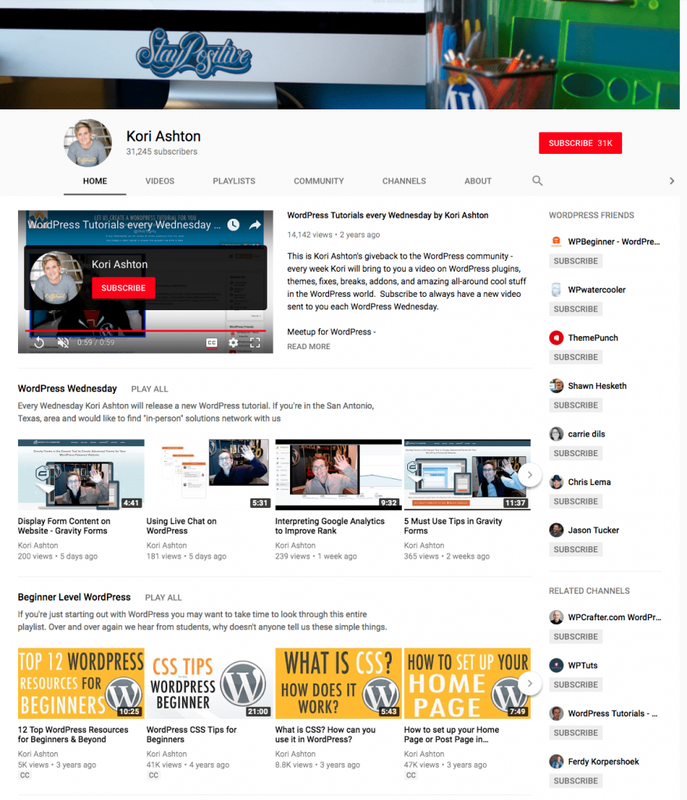 And if you want to browse other examples of WordPress websites, you will find them in the showcase of WordPress.org. If we take a look at the WordPress versions that are installed on websites, in the middle of the last month of 2018 the most installed version was 4.9 with 59% of websites, and 5.0, recently launched, already had 9.8% of installations. 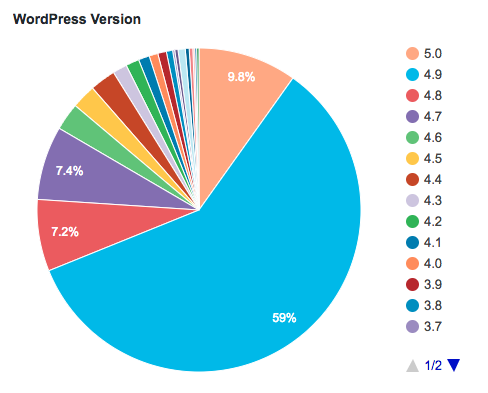 WordPress versions installed (source: WordPress Statistics). Languages of WordPress installations (source: WordPress Statistics). We can see that English (from Australia, Canada, South Africa, the United Kingdom and the United States) is installed in 52.1% of WordPress websites, followed by Japanese with 6% and then German and Spanish (from Chile, Mexico and Spain), both with 5.4%. I would like to take this opportunity to comment that on the subject of languages, WordPress.org has 180 teams of volunteers in 45 locations who are dedicated to the translation of the core WordPress, themes and plugins. If anything is key in WordPress, it’s its community. WordPress couldn’t be what it is today if you don’t consider its community. You’ve already seen the ratio of revenue versus the number of Automattic employees. And the quick question that comes to mind is why are so many people volunteering to contribute to the WordPress project? Of course, there may be an altruistic reason, but it’s not the only one. 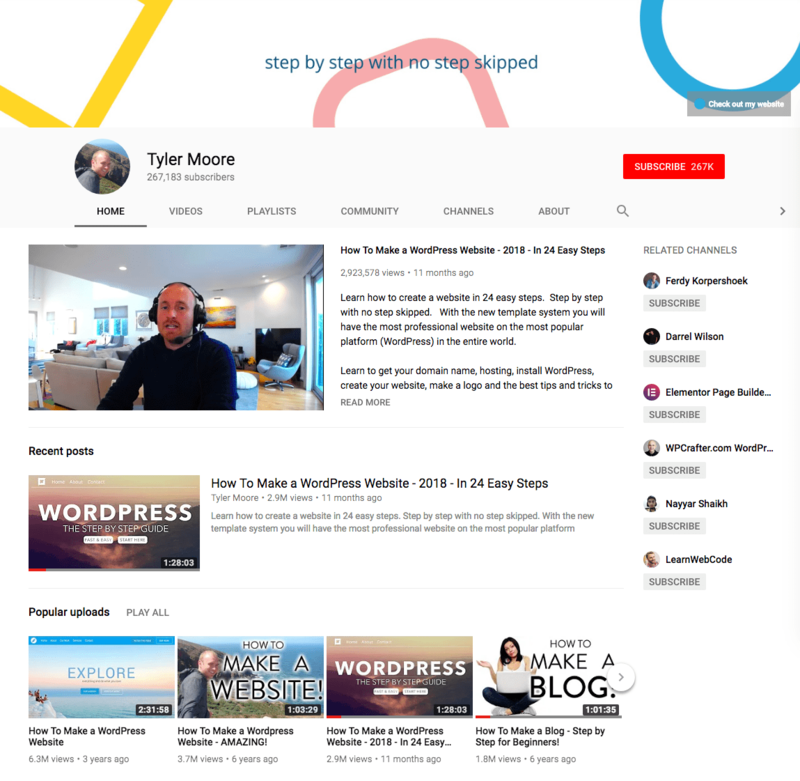 Those of us who contribute to WordPress usually work for companies that sell WordPress products or services (plugins, themes, web development, consulting, training, etc.). In other words, we earn our living thanks to WordPress and we are interested in the WordPress project growing to have more business opportunities. 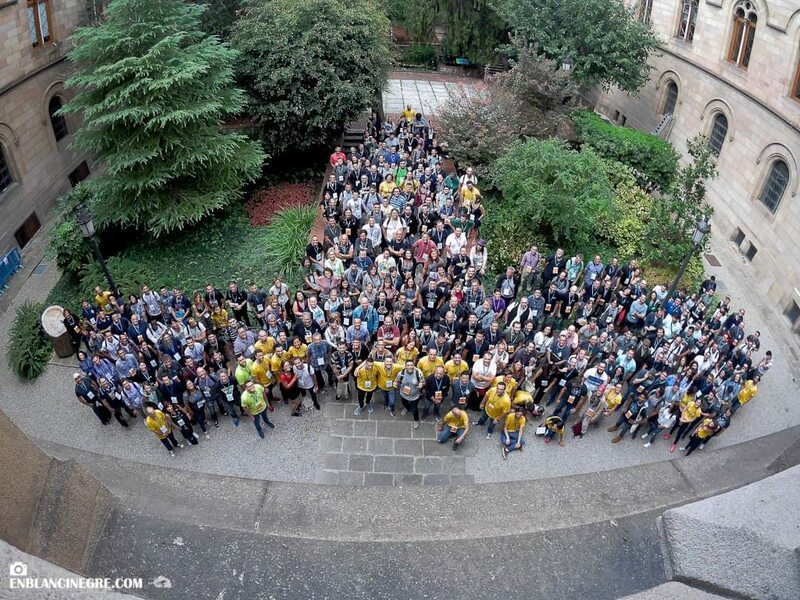 WordCamps 2018 (source: WordCamp Central). Please note that in all WordCamps, both the organizers and the speakers are volunteers who do not charge anything for the work done. 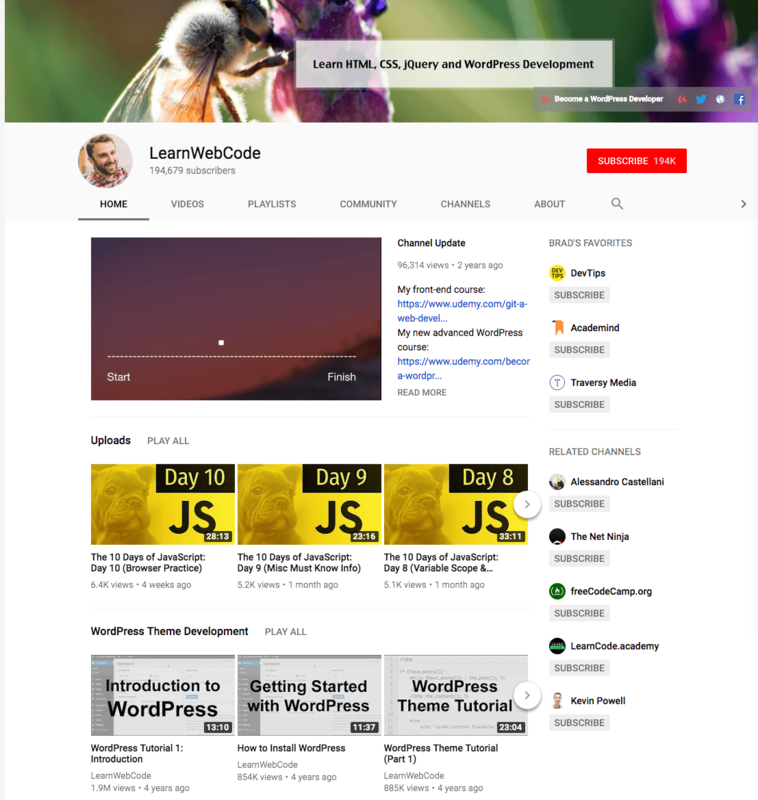 And here you have to add the events related to WordPress that are for some niche market like Publishers, WooConf, LoopConf, WP Campus, and A Day of REST, as well as all the set of WordPress meetups that are organized locally to create local WordPress communities. 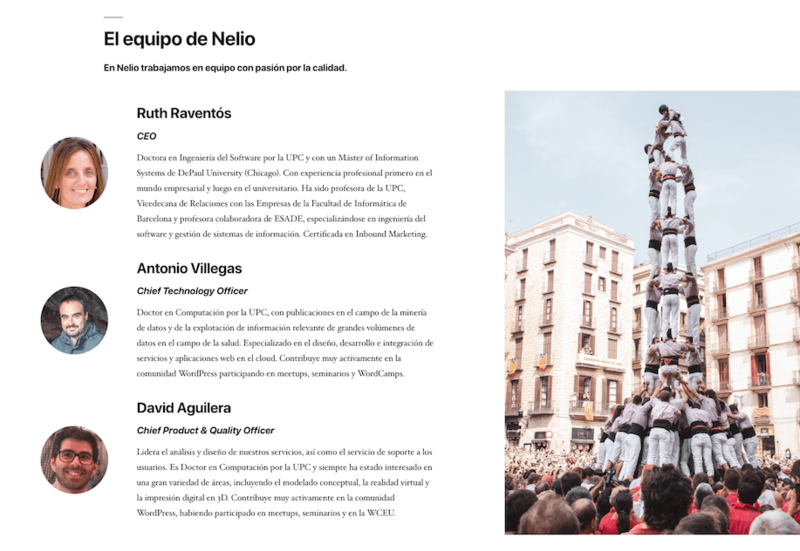 To give you an idea of the contribution that companies can make to the WordPress community, in 2018 the entire Nelio team was involved in the organization of WordCamp Barcelona 2018. But not only that, we also participated in WordCamp Europe 2018, WordCamp Madrid 2018, and currently David and Toni are part of the organizing team of WordCamp Europe 2019. As you can see, it’s still a lot of hours dedicated to the community and the project. 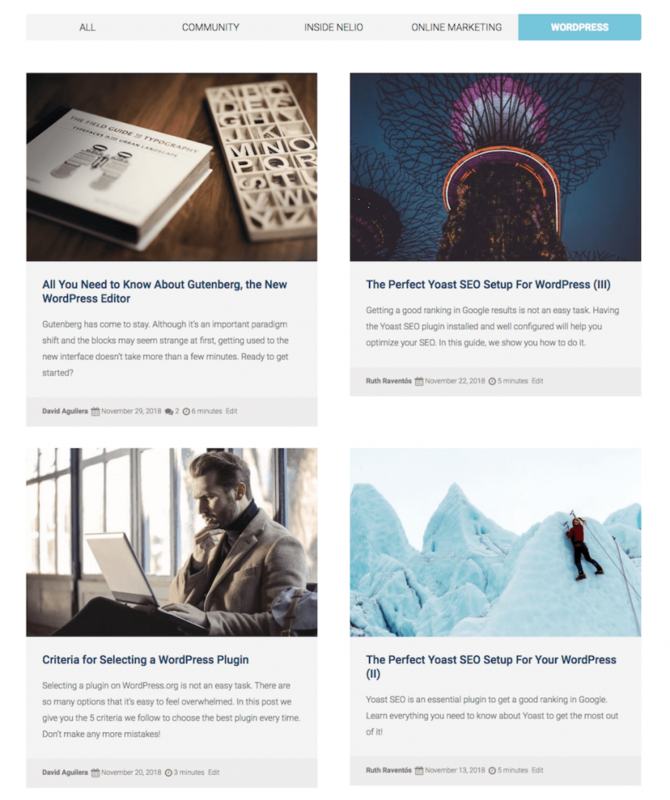 In the WordPress Directory you have free GPL licensed themes and plugins that can then have premium versions with paid functionalities or support services. The average price of a WordPress theme is less than $59 and prices can range from $10 to $200. 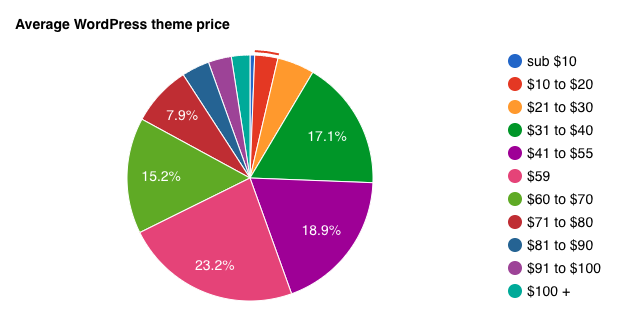 And what are the most popular WordPress themes? WordPress theme usage (source: BuilWith.com). According to BuiltWith, of the one million websites analyzed, the most popular WordPress theme is WooComerce’s own (25%), followed by Genesis and Divi (5%) each and Avada (4%). And about plugins? Currently, you’ll find more than 55,000 plugins in the WordPress Directory. Some of them with more than 5 million active installations. 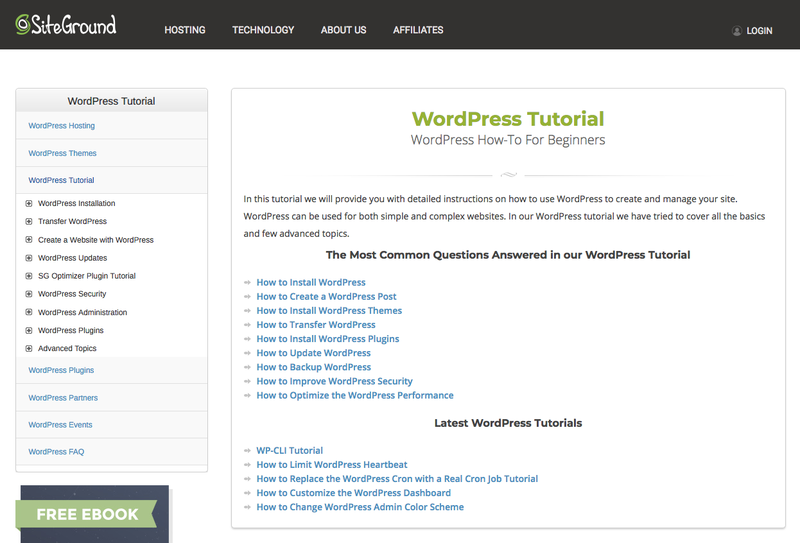 Popular WordPress plugins (source: WordPress Directory). 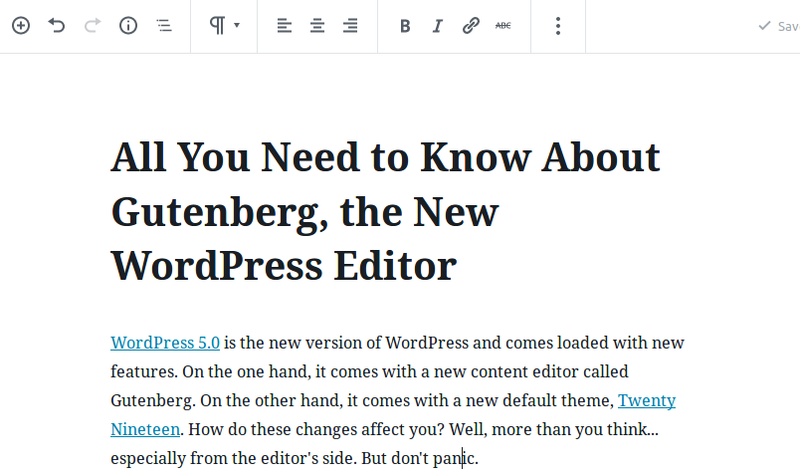 And precisely about plugins, Matt Mullenweg commented at WCUS 2018 that, with the aim of promoting Gutenberg, at this moment the plugins that were going to stand out the most in the directory are all those that offer blocks for the new block editor. 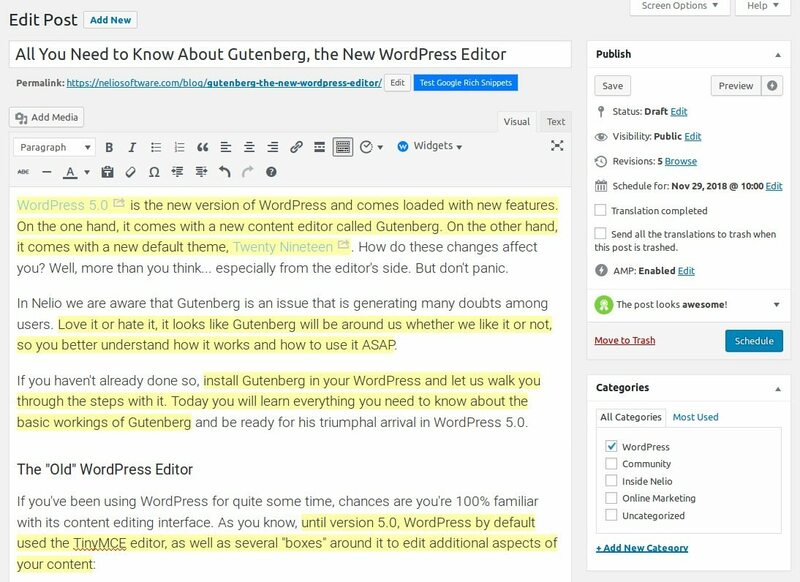 Surely as a WordPress user you don’t need to know all this information for your everyday, but they will help you understand and explain better that WordPress is not just a template or a little program to create a website; it’s something more, don’t you think? Featured image by Evgeni Tcherkasski on Unsplash. Are you increasing your web traffic and you have more and more followers in social networks? If so, congratulations! You seem to be on the right track, but… Are you getting your visitors to buy your services or products? Are you increasing your revenue? Did your face look like this? (source: mashable on Giphy). If these questions have made you a little uncomfortable is that you need to increase the conversion rate of your website. That is to say, make more visitors of your web carry out those actions that you really want them to do. Forget about vanity metrics! But how do we optimize our website to increase the conversion rate? First, don’t forget to perform A/B tests on your website that will provide you with real data about your visitors’ preferences at all times. And, as I told you recently, create attractive lead magnets for your website visitors. 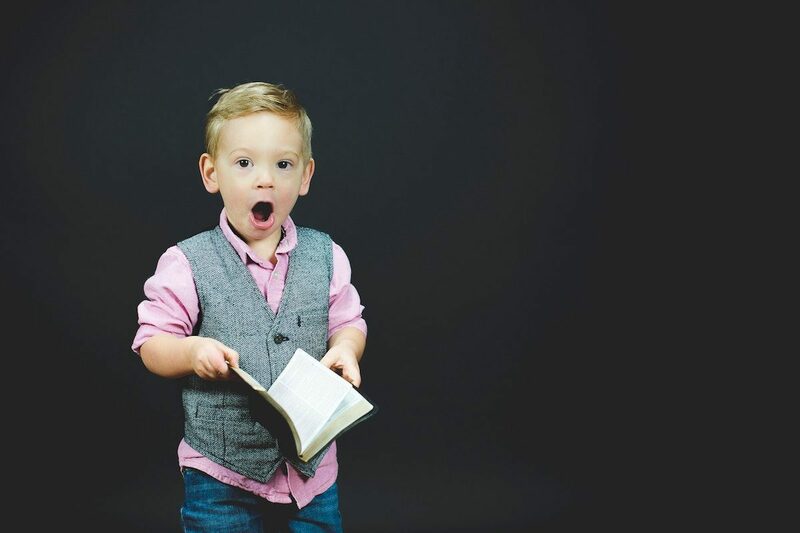 Remember that lead magnets are attractive free offers that you offer to your readers, in exchange for them giving you contact information, subscribing to your newsletter or helping you to promote yourself. Before you continue reading, the three plugins I’m telling you about below are premium plugins, they are not free. The functionalities they offer compensate for their cost. And it’s also good that we’re in solidarity with developers who have to make a living offering great products 😊. Thrive Leads licenses and pricing. 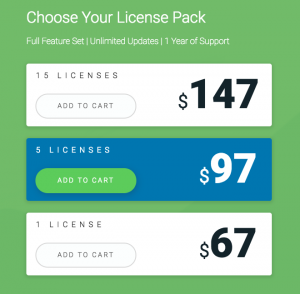 For a single payment of $67 you get a license for a single website; for $97 you have up to 5 licenses; and for $147 you get 15 licenses. All three plans include unlimited updates and one year of support. It is a plugin easy to install and start working with without technical knowledge. But it is important that you take into account before you start working with this plugin how Lead Groups work. These are used to create campaigns or group a set of forms that you want to show in certain places on your website (for example on certain pages or all posts etc.). You should know that if you create several groups and design two forms for the same website, the opt-in of the group at the top of the list will always prevail. Don’t get confused with this or you won’t know why certain lead magnets don’t show up to the user. OptinMonster is one of the most popular opt-in applications in WordPress. OptinMonster itself is not a WordPress plugin, it is a stand-alone payment application that integrates into WordPress. 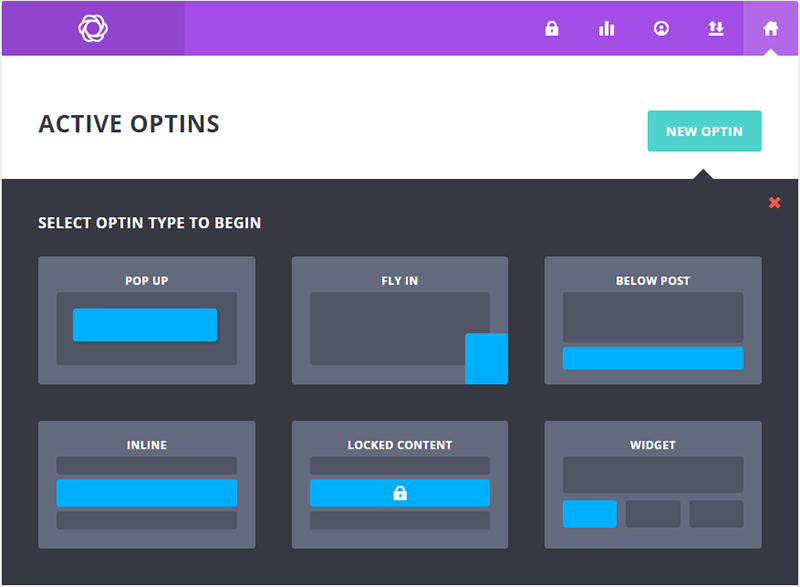 In the WordPress Directory you will find the free OptinMonster App plugin connector that allows you to create an account and connect to OptinMonster. You can subscribe to OptinMonsterwith 4 different plans: Basic ($108 per year), Plus ($228 per year), Pro ($348 per year), and Growth ($558 per year). OptinMonsters plans and pricing (billed annually). And as shown in the image, Basic is for a single site, with which you can create 3 simultaneous campaigns with a maximum limit of 5,000 views per month; Plus is for up to 3 sites and you can create unlimited campaigns with a maximum of 15,000 views per month; the Pro plan allows you to have it installed in 5 sites and the maximum of campaign views is 100,000 views per month; and with the Growth plan you can install it in 10 sites and conduct campaigns that have 500,000 views per month. OptinMonster and Thrive Leads offer many similar functionalities. With the OptinMonster’s Pro plan, you have practically the same types of forms as Thrive Leads, the same triggers, and you can also perform A/B tests. 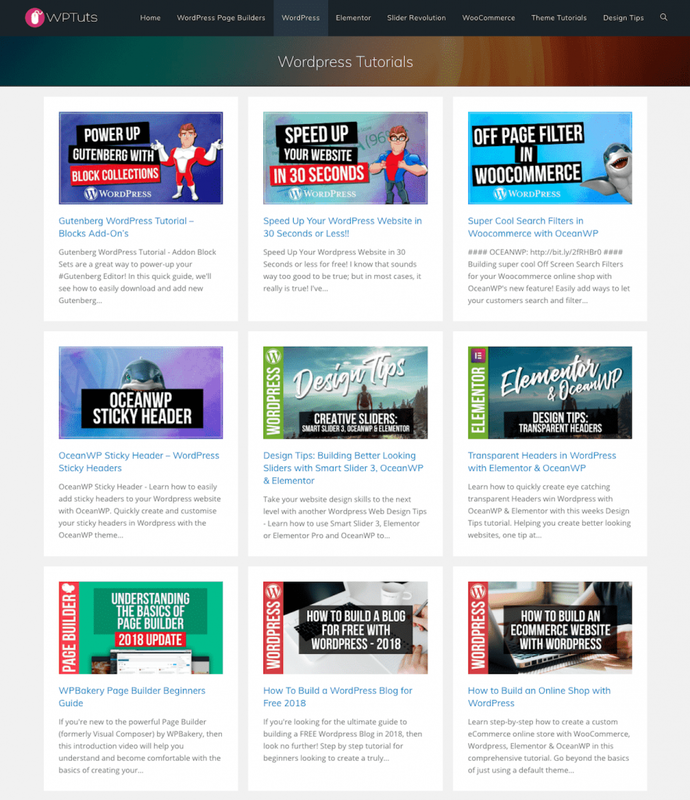 Thrive Leads is a WordPress plugin and OptinMonster is a stand-alone software. That means that with Thrive Leads everything you create is saved in your WordPress database; in the case of OptinMonster you save it in its database. Also, if your website is not WordPress (that is, it’s a PrestaShop, Shopify, or Magento, for example) OptinMonster is your product. Finally, if you want to manage several accounts at once, with OptinMonster you can do it directly from its application; with Thrive Leads you will have to go to each of the different WordPress sites. The two products have different types of visual editors to design the popups. 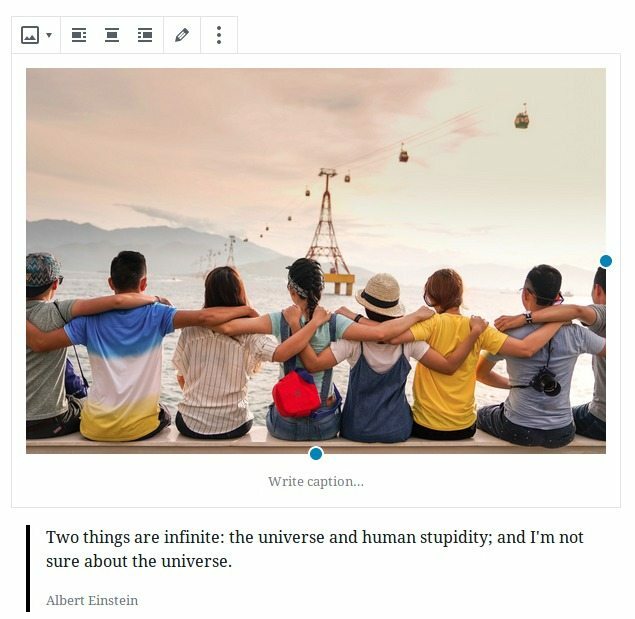 Thrive Leads has its own quite complete visual editor with which you can edit all the opt-ins and OptinMonster has the Canvas function with which you can edit some opt-ins. OptinMonster focuses more on user behavior and includes pop-up trigger options (Adblock detection, geolocation, etc.) that can be especially useful if you have an e-commerce. Thrive Leads focuses more on the results you get from A/B tests and getting more subscribers. In OptinMonster each campaign is determined by the type of opt-in it uses. That is, Campaign 1 uses a normal pop-up and Campaign 2 uses a pop-up that slides from the right side. In Thrive Leads the campaigns are determined in Lead Groups where you group several forms. For example, Campaign 1 will include the two previous pop-ups and a widget. 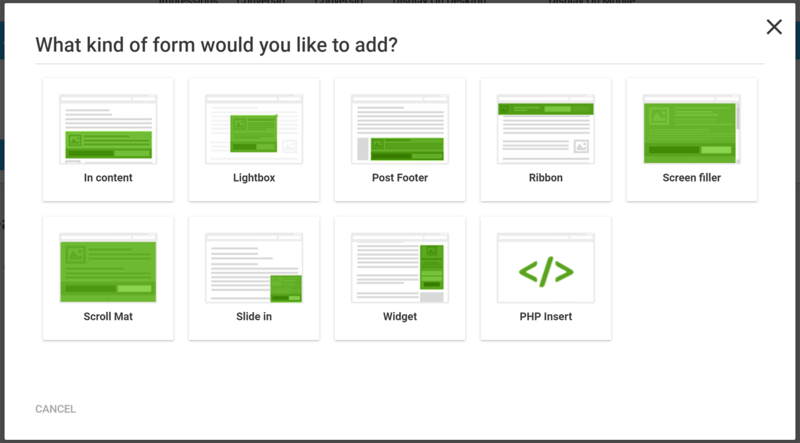 A more recent opt-in plugin for WordPress that has been growing in popularity is Bloom. Bloom is a plugin from Elegant Themes, best known for its Divi theme and Divi Builder visual editor. Elegant Themes including Bloom plans and pricing. The price is $89 a year or $249 for life. And this price not only includes the Bloom plugin, but also includes all Elegant Themes themes and plugins. 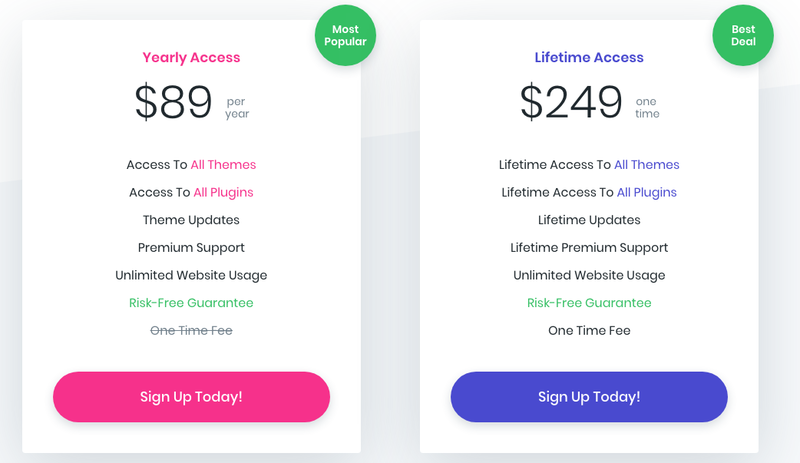 So, if you had already paid for one of them, it is clear that this option is very important to you, since you already have it for free; but if you are only interested in this plugin, it is cheaper than OptinMonster but more expensive than Thrive Leads. As you have seen, the three plugins, Thrive Leads, OptinMonster, and Bloom meet the needs you may have to capture leads: multiple types of forms, templates that you can customize, integration with the most popular email services, and A/B tests. Some of the differences to highlight are, on the one hand, that OptinMonster and Thrive Leads include the “leave page” trigger and Bloom does not. In addition, each has a different set of options and levels of control over how to create campaigns. And finally, with Bloom and Thrive Leads, with a single payment you have all the functionalities and with OptinMonster you have different prices for different features. $67 – Thrive Leads (just one license). $348 – OptinMonster (Pro package with all features included). Our opinion? We use Thrive Leads because, from our point of view, it’s the one that offers the best quality-price ratio. But if you already pay for Elegant Themes, which already includes Bloom, you probably don’t need anything else. And if you are looking to optimize an e-commerce or if your website is not made in WordPress, or you want to manage several accounts at once, do not hesitate to consider the OptinMonster option, which is very complete. Featured imabe by Belinda Fewings on Unsplash. Mac, Windows, or Linux? Android or iPhone? Netflix or HBO? WordPress or Drupal? The number of options to choose from is greater than it has ever been. And it’s a trend we see everywhere. You’re probably thinking that’s fine: the more options, the better, right? After all, it’ll be easier for us to find what we really need and, therefore, be happy with our choices. Well, it’s not. I have no idea what I want… by desusandmero on Giphy. In this article from the Huffington Post the author states that “There’s a body of evidence suggesting an overabundance of choice makes us anxious and mistrustful.” The more options we have, the less happy we are. Just watch this TED talk on the paradox of choice by Barry Schwartz. Well, we see the same problem arise when it comes to WordPress plugins. There are thousands of plugins available in the WordPress repository, so it’s not uncommon for many of them to overlap in functionality. And that’s where users have the problem: which plugin do I choose? They’re so similar, I don’t know which one is the best… and I don’t want to make a bad choice! In this post I’ll share with you the recipe we follow to choose the plugin that best suits our needs. Hopefully, this will make your life easier and if you choose poorly… well, you have someone other than you to blame (that is, me 😇). As you can read in WPBeginner, “A plugin is a piece of software containing a group of functions that can be added to a WordPress website. They can extend functionality or add new features to your WordPress websites”. 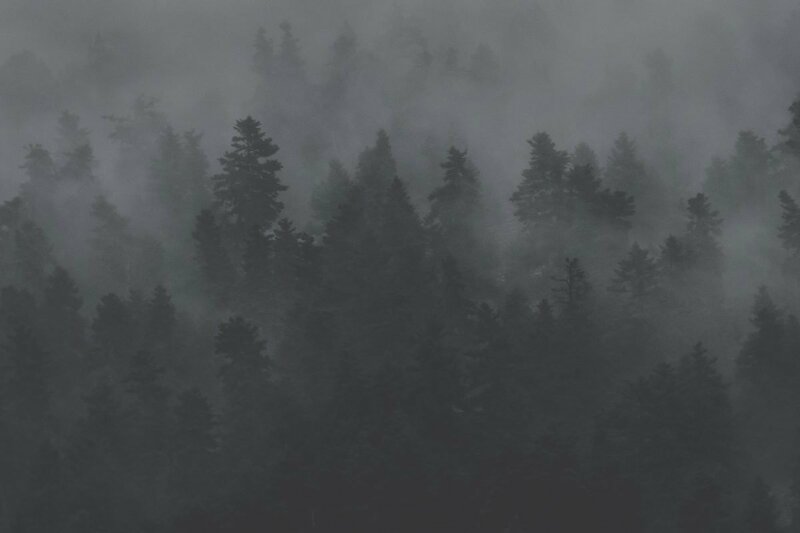 Plugins, then, are what makes WordPress so successful: when WordPress can’t satisfy one of our needs, we simply have to take a look at the plugin ecosystem and see if there’s one that does. 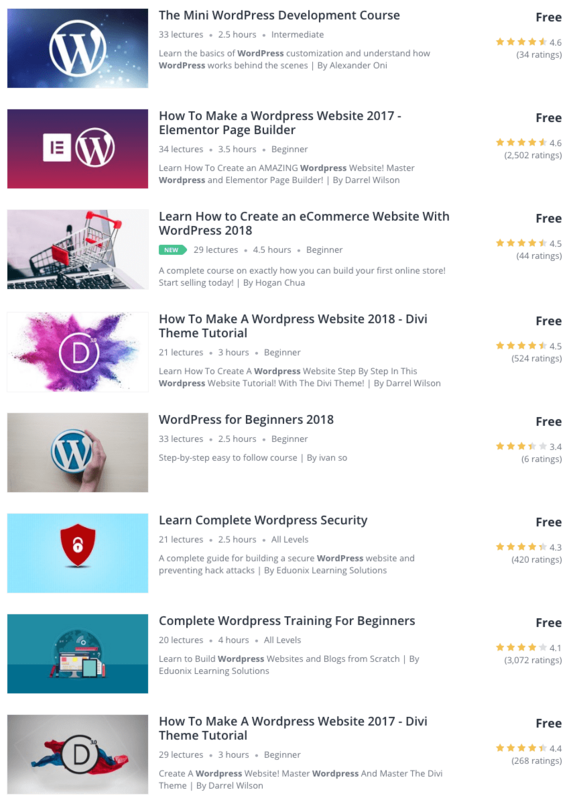 Unfortunately, a quick search on WordPress.org (or even in the premium plugin market) reveals the truth: there are plenty of options in each of those categories! Which one do you keep? Choosing “the best plugin” to solve a certain problem is not easy (because, among other reasons, what is “better” is relative and depends on your criteria). 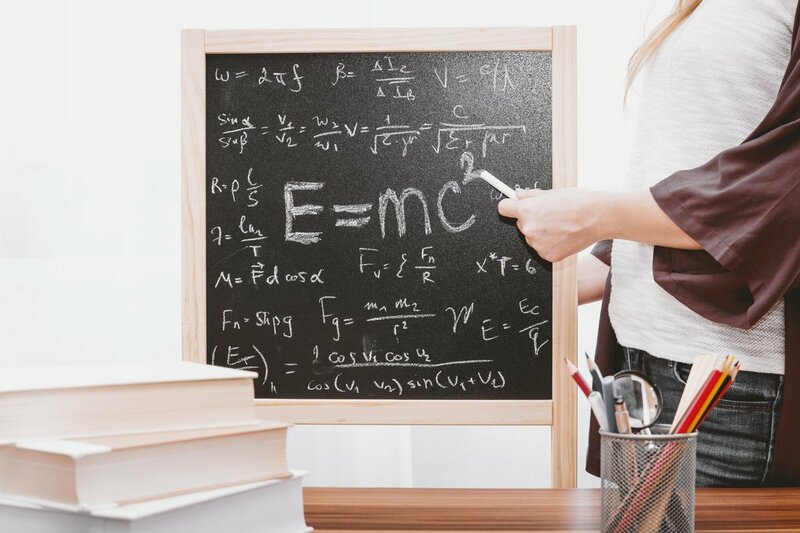 But there are a number of criteria that, regardless of what your exact needs are, you will have to evaluate in order to find a good choice that satisfies you in the long run. So, without further ado, let’s take a look at the criteria I personally follow when looking for new plugins. I ordered the criteria from most to least important, so that each criterion helps you filter out a few options. If you want to go from A to B, you probably don’t need a Transformer. A simple car is more than enough. And what about a bike! It’s simpler and might be more effective! Source: Giphy. The second criterion that you must ponder is the reputation of the developer. When you install a plugin you’re basically letting somebody else’s code run in your website, so you’d better make sure that person or organization is trustworthy. 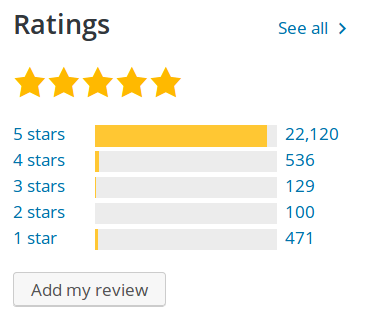 Yoast SEO Ratings at WordPress.org. Screenshot showing Yoast SEO’s statistics. 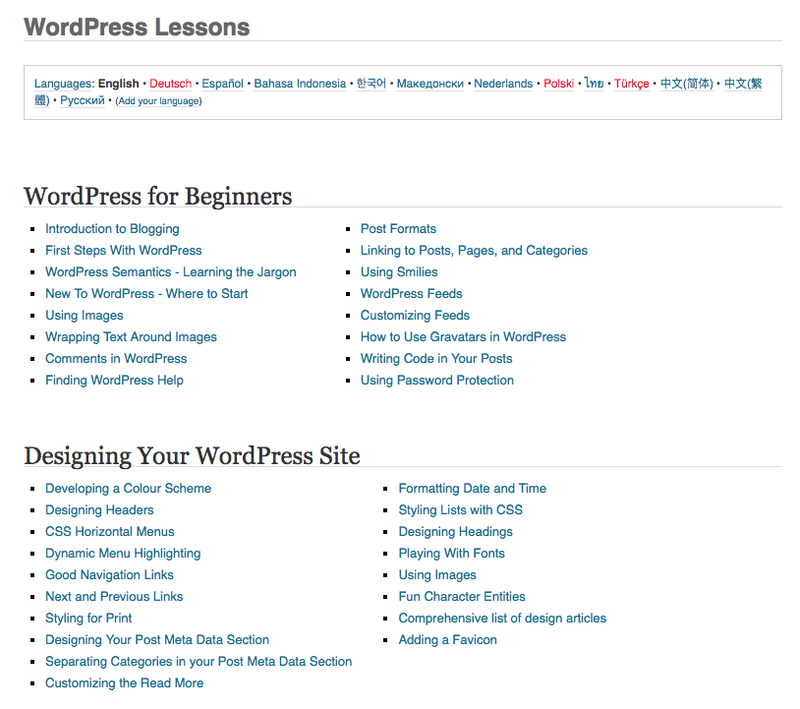 The rate at which WordPress evolves is very high. New versions with new functionalities and bug fixes appear often. Plugins should not be an exception to this rule. If you are going to install a plugin on your website, look at its development pace. The fact that a plugin hasn’t been updated for a long time can be a bad indicator: maybe the developer has lost interest in the plugin and it’s about to be abandoned. 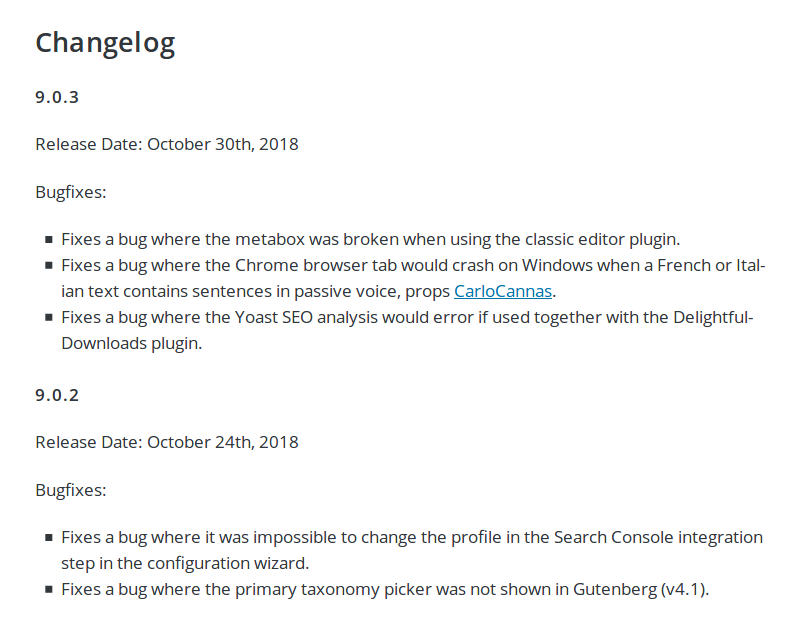 The Changelog of a Plugin summarizes the latest changes introduced in a plugin. Checking a plugin‘s changelog to see how it’s evolving or taking a look at its last update date are very useful indicators to predict its future. My recommendation: select one that is being actively developed. The level of support and community a plugin has is also extremely important. 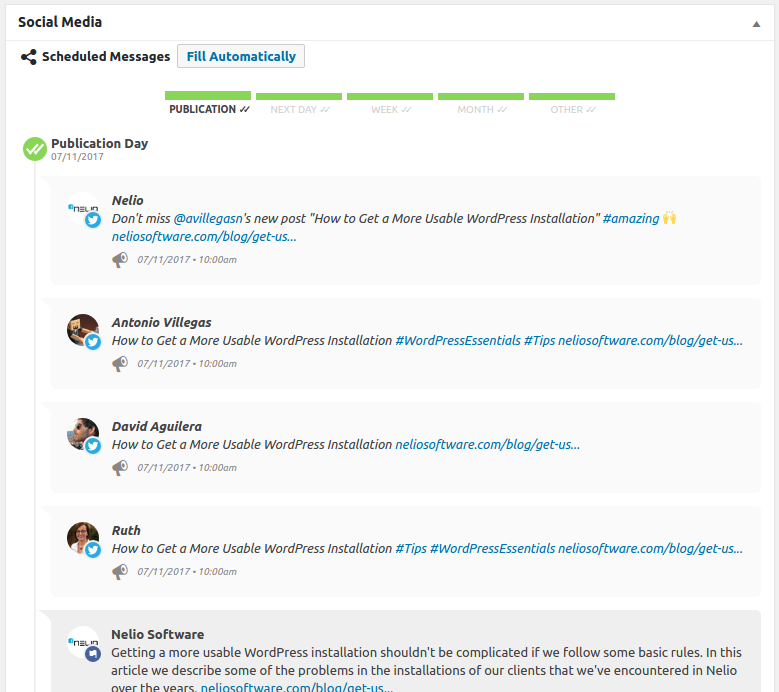 A plugin that has many active users and is constantly evolving will probably have a lot of activity in the support section. 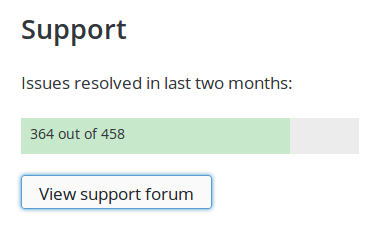 Number of issues resolved in the lat month. Pay attention to the community around a system: if you ever need help, the more people using the plugin, the higher the chances of finding someone who can lend a hand. You can find this information in WordPress.org, in the Support section. Take this data into account when considering different options. Money. Free plugins, freemium plugins, premium plugins, subscription-based plugins… the options are endless, and you should look into all of them. Depending on your specific needs and your budget, a paid solution might be the best option you have. Language. Not all plugins are translated to your specific language. If that were the case, make sure you’re more or less fluent in English or you might not be able to use the plugin properly. The 5 criteria I use to select the perfect plugin are Focus, Ratings, Development, Support, and Others. I hope they help you make the right choice too. Tell us what you think about them and let us know what other criteria you have in the comments section below. Featured Image by bruce mars via Unsplash. 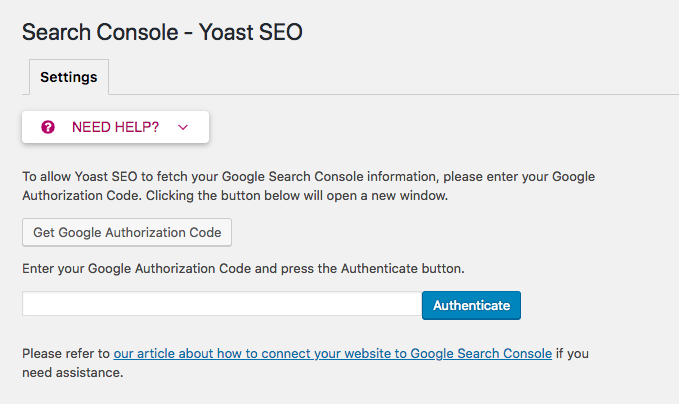 This post is the continuation to the first post about the perfect Yoast SEO configuration, where I explained the main functionalities that Yoast SEO offers you and how you can configure it quickly with the wizard. Here we intend to go a little deeper into the configuration, so that you can polish those details the wizard doesn’t address. After installing the plugin in WordPress, you’ll see that you have the following menu options: General, Search Appearance, Search Console, Social, Tools, and Premium. 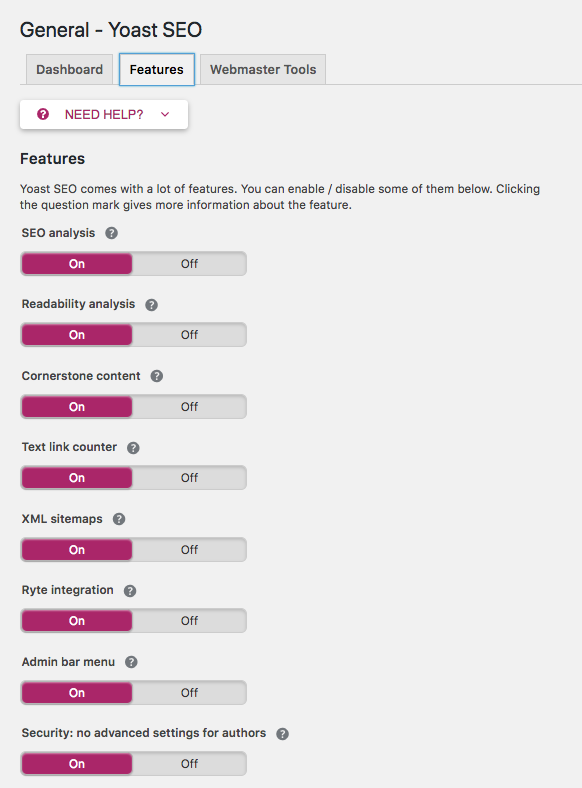 Yoast SEO plugin menu options. 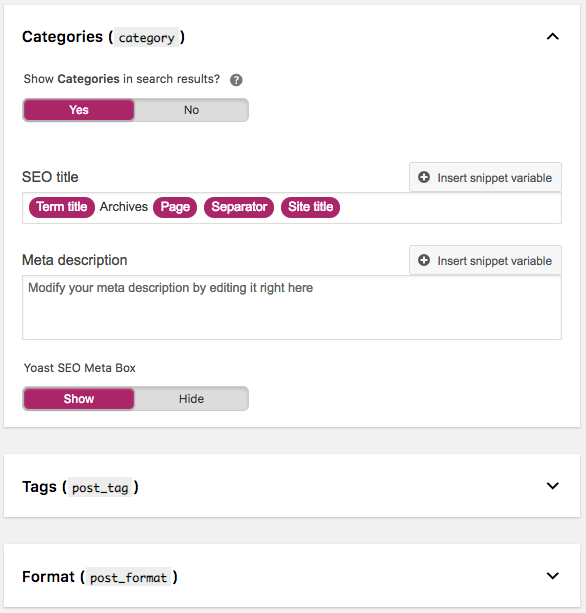 In this post we’ll see what you can configure in detail in the first two options of the Yoast SEO menu: General and Search Appearance. Under the General menu option, you will find three tabs: Dashboard, Features, and Webmaster Tools. 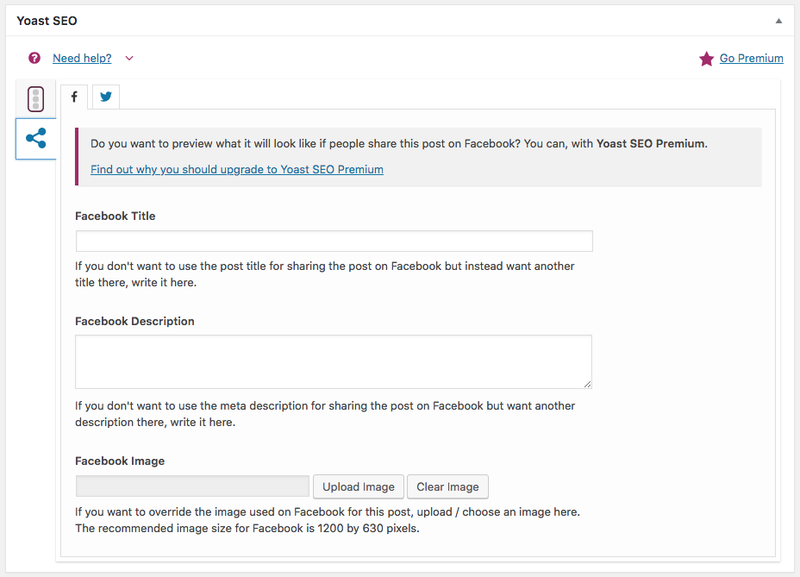 General menu option screen of Yoast plugin. The first tab, Dashboard, as you can see in the image above, links to the wizard that I explained in the first post on how to configure Yoast. It also warns you if you have any issues and gives you the link to subscribe to the Premium plan. Additionally, as you can see on the right of the screenshot, it gives you other recommendations to learn more about the tool or about SEO. In the Features tab you’ll find the options that you have activated or deactivated from the plugin. 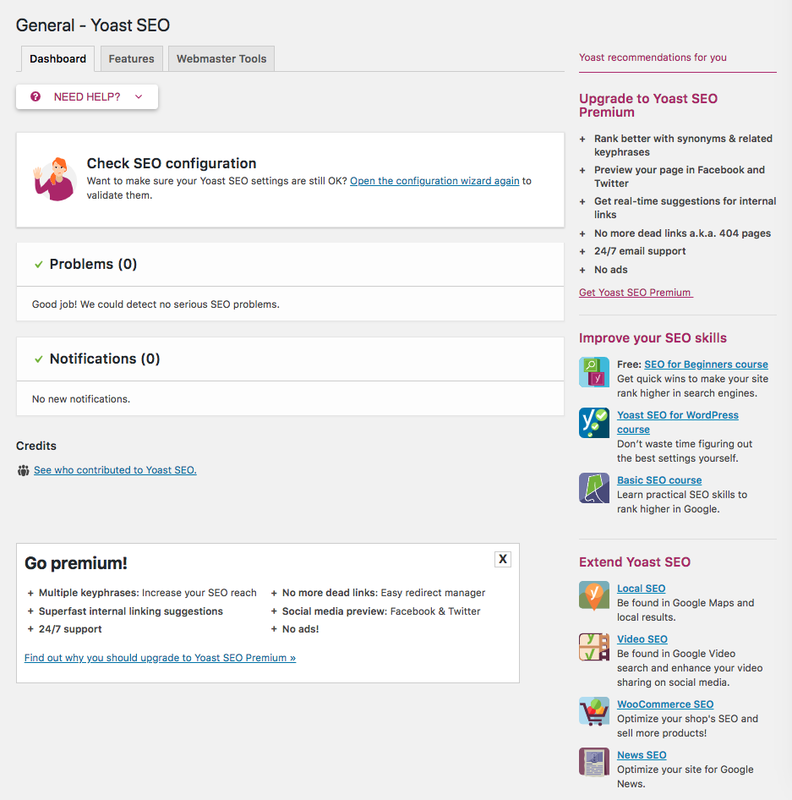 Features tab of Yoast SEO plugin. By default they are all activated. And it’s OK to leave them like this. But what does each of them mean? 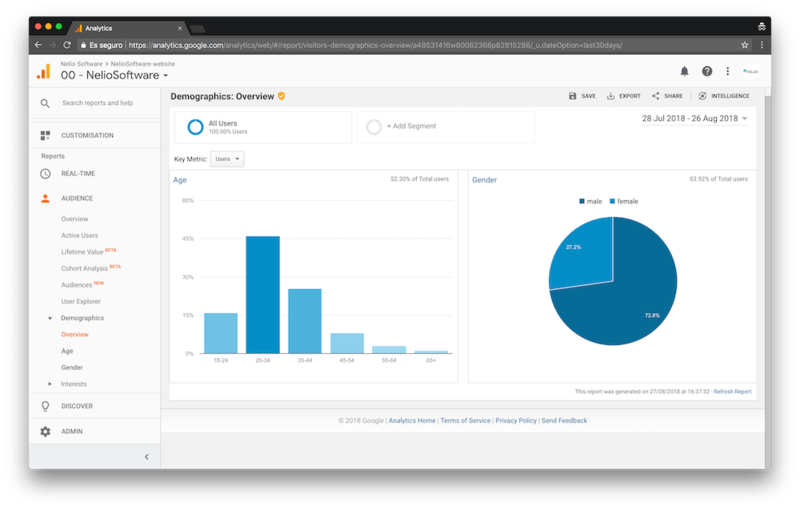 The SEO analysis are suggestions on how to improve your posts and pages for SEO, such as defining a snippet, indicating a keyword, using it in your text, URL, images etc. 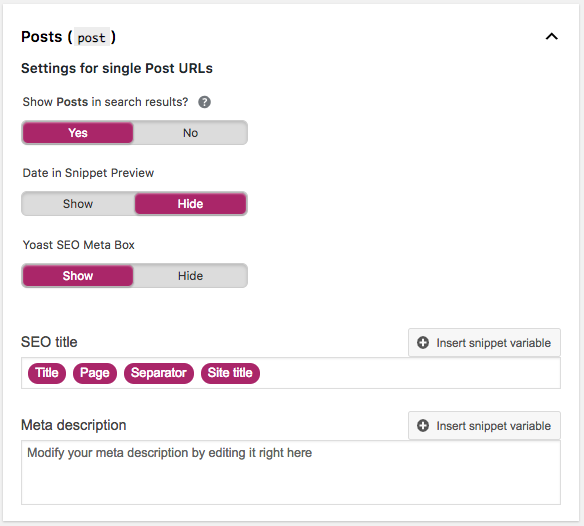 If you deactivate it, you’ll still be able to define the snippet of your post, but the plugin will no longer makes suggestions on how you can improve it. The Readability analysis allows Yoast to make suggestions on how to make your text more readable. If you deactivate it, the plugin won’t run the analysis and, therefore, you won’t get any suggestions on how to improve the copy of your posts. Cornerstone content is used to indicate that a certain type of content is essential to your website. 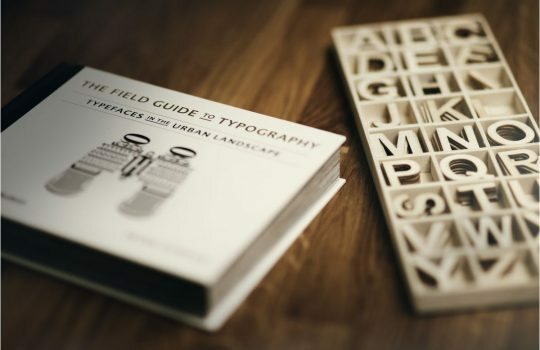 For example, you could indicate that your star product page is your cornerstone content. 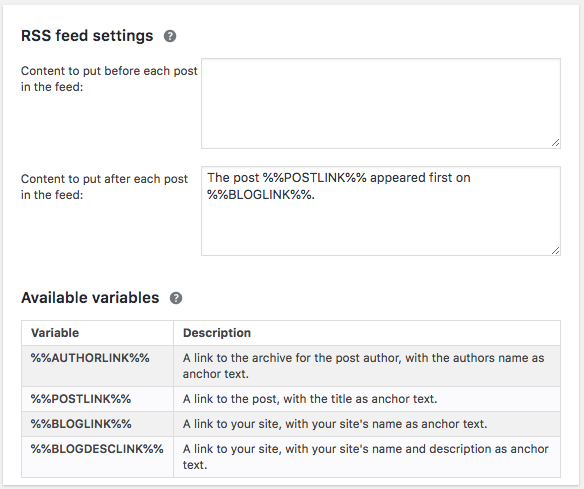 The Text link counter controls whether you have included texts with external links in your posts. As you know, external links can help give a post more credibility. 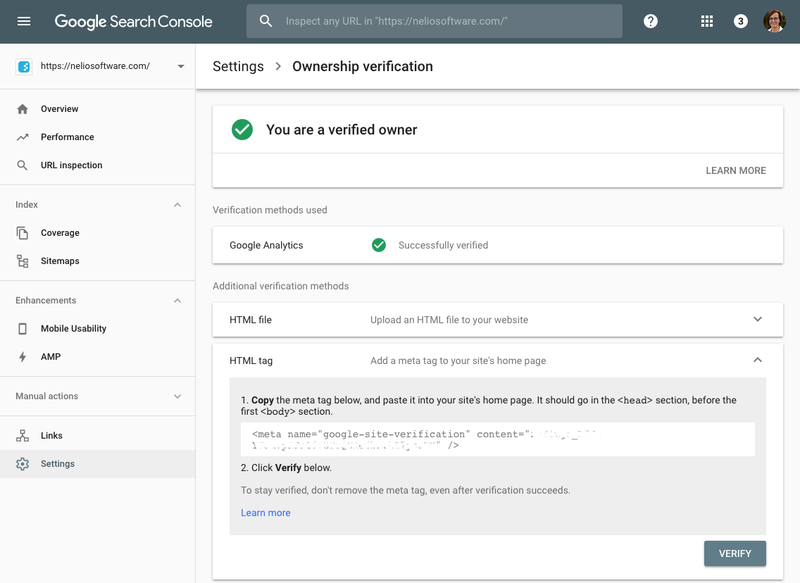 When XML sitemaps is active, Yoast will generate an index of the most important pages of your site, making it easier for Google to identify what your web content is about. Don’t deactivate it if you want to position yourself better in the Google ranking. 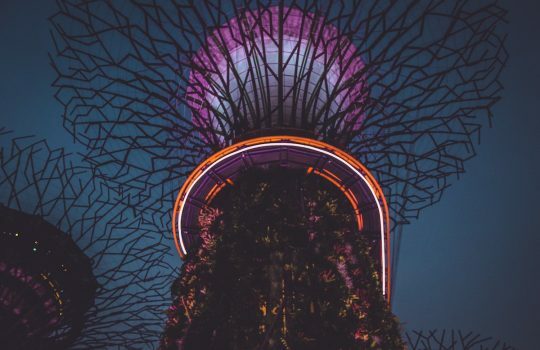 Ryte integration allows Yoast to also use some of the features provided by Ryte, a tool that monitors, analyzes, and optimizes key elements of websites. Yoast uses it to warn you if your site is no longer indexed in search engines. 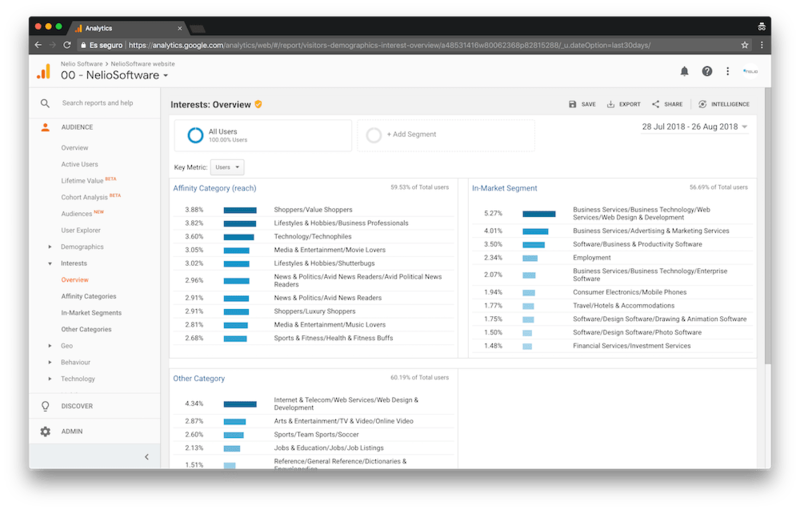 The Admin bar menu contains useful links to third-party tools to analyze pages and make it easier for you to see if you have new alerts. 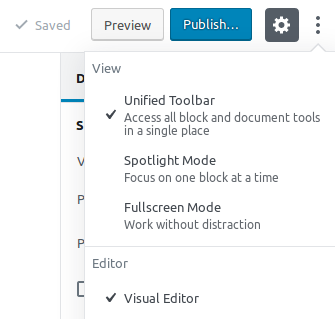 And with the Security option active, you make sure that only administrators and editors have advanced plugin settings options. If you disable it, you grant authors access to the advanced plugin settings options. Finally, let’s go to the last tab, Webmaster Tools. 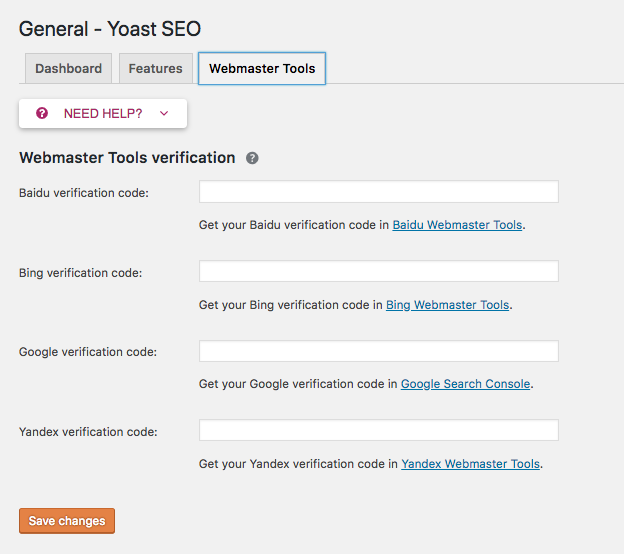 Webmaster tools tab of Yoast SEO plugin. Here, you can enter the verification code of each of the search engines it indicates. The most important is Google‘s. I already commented on the information in this section in the first Yoast configuration post, so I’m not going to go into details again. 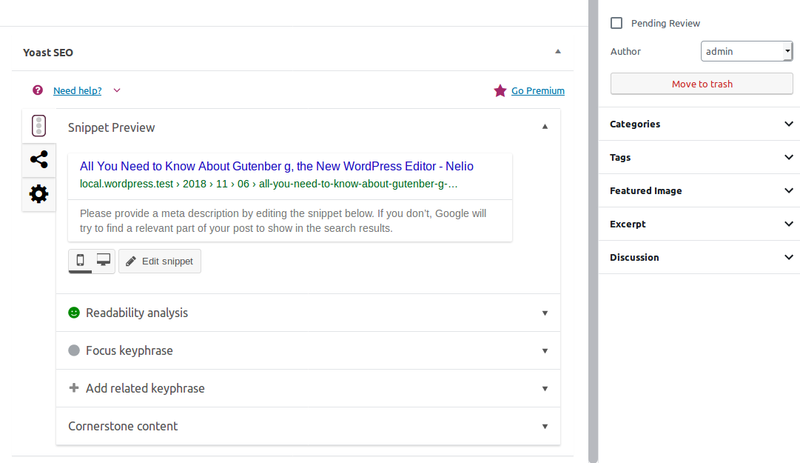 The second option of the Yoast menu is the Search Appearance, and as you can see, it has seven tabs: General, Content Types, Media, Taxonomies, Archives, Breadcrumbs, and RSS. On each of these tabs you indicate how you want Google to display information about your content. 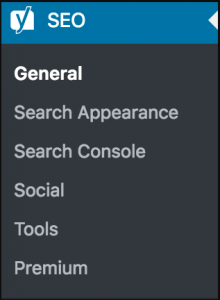 General tab of the Search Appearance option. 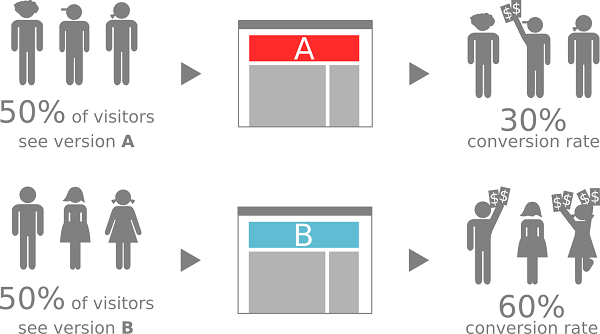 Here you indicate how you want your website’s snippet to look by default. 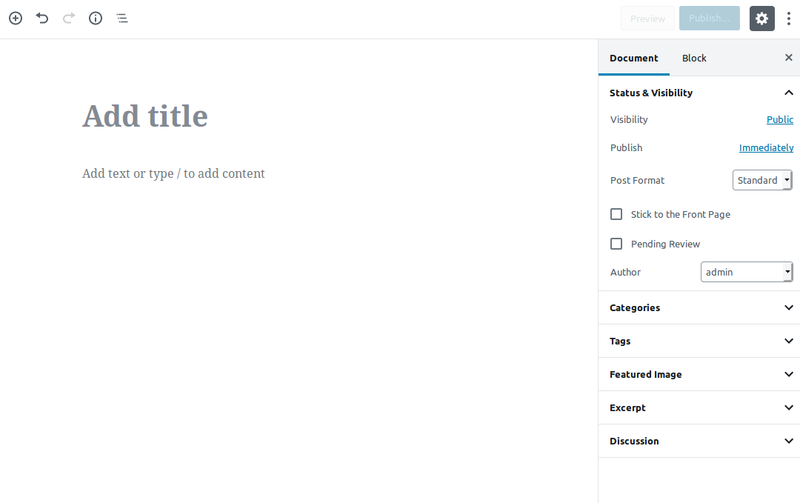 For example, if you look at the image above, you’ll see that Yoast will create the following default SEO titles: first the title of the content, then the page (if that content is paginated as is the case with feeds), a separator (which you have indicated before), and the default description that the author has defined. The advantage of having this information filled in is that you won’t have any URL without a decent snippet. The Content Types tab moves down to the next level of detail, i.e. you detail the appearance of the snippet in posts and pages. Indicate the appearance of the posts. Then for the pages it’s exactly the same. For your blog posts and the rest of your web pages, you can indicate whether or not you want them to be part of Google searches, if you want to include the date of publication in the snippet (it is recommended not to do so as it tends to lead to fewer clicks) and how you want to show the title and description by default. 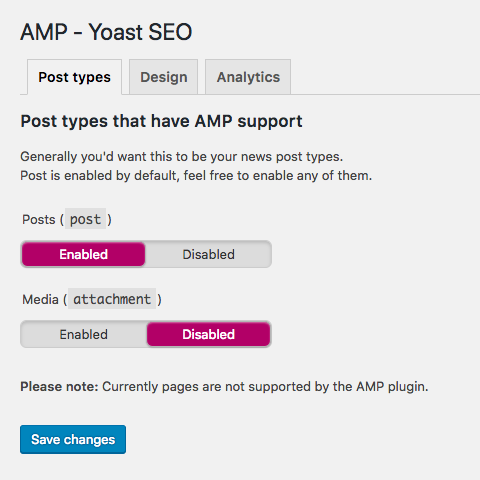 And if you choose to hide Yoast SEO meta box, the Yoast box under the posts and pages disappears (I don’t recommend it, if you want to get the most out of this plugin). 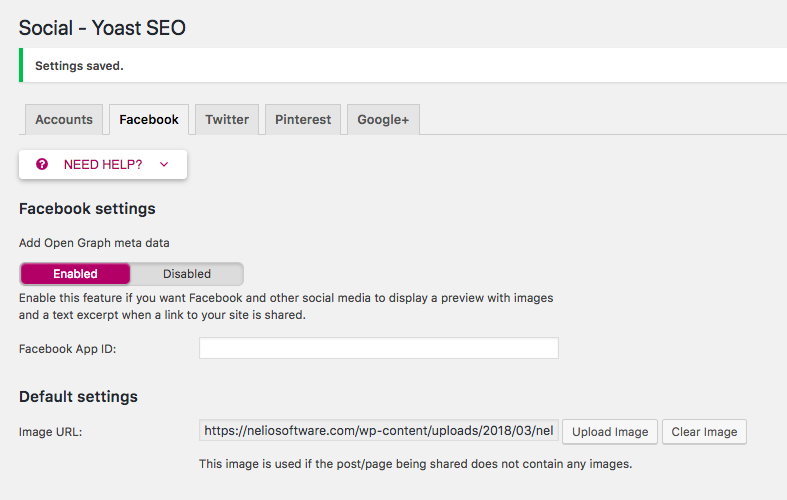 In this tab you indicate if you want the URL of any image or attachment included in a post or page to be redirected to that post or page that contains it, instead of to the URL of the image or attachment itself. URL of media and attachments. The recommendation of Yoast and ours is that you redirect attachment URLs to the attachment themselves. It doesn’t make much sense to index the images, since what you usually want is for the posts and pages to take authority in Google. Now it’s the turn of the Categories, Tags or any other custom taxonomy you may have created on your website. Indicate how you want categories and tags to be indexed. 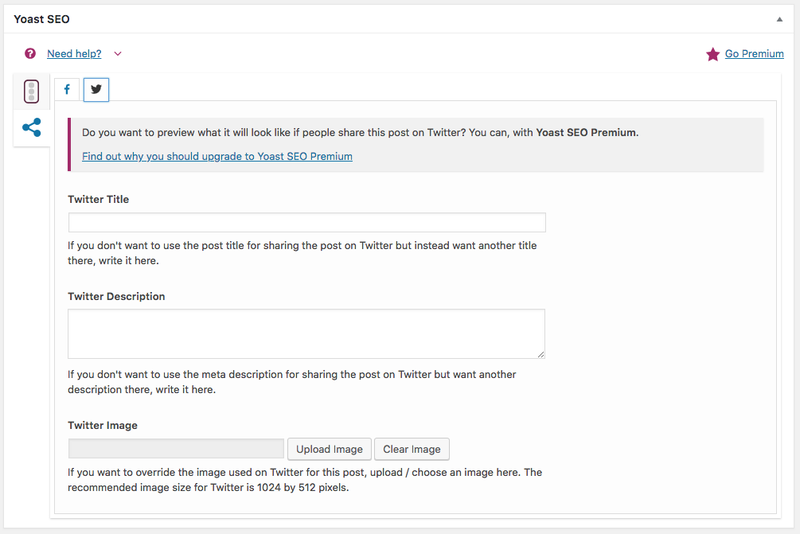 Similar to posts, in the case of categories and tags you can first indicate if you want them to be indexed or not. On this subject, there are those who recommend that you don’t index categories or tags until you have at least some related content on it, and there are those who argue that they can be very useful to rank long tail content on Google. 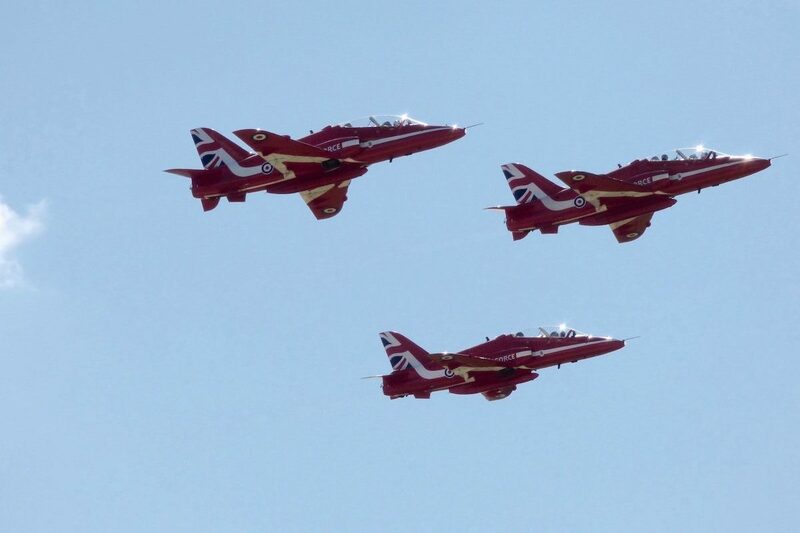 We have them indexed. 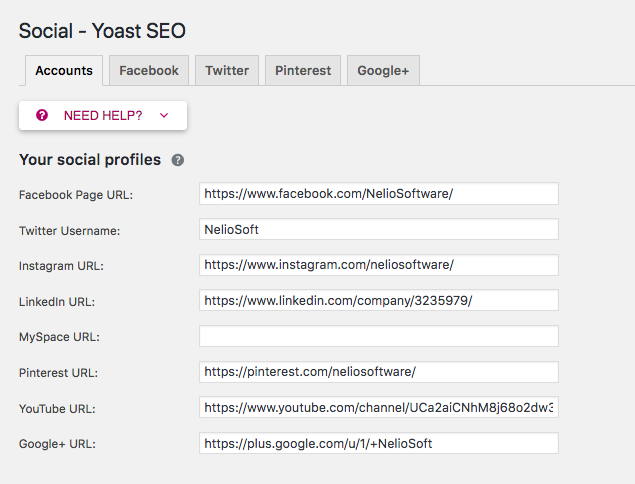 Then, as you see in the image above, you can indicate a SEO title and default description, and if you want in the category edition to have the Yoast SEO box. And for tags, it’s exactly the same. Archives are feeds or pages that link to lists of posts. 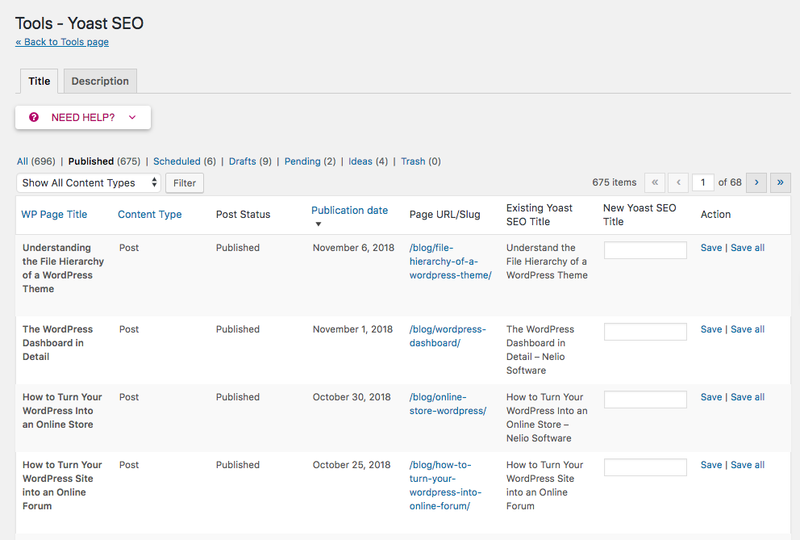 These include all the posts written by a certain author (Author archives settings) or listings of posts on a given date (Date archive settings). Indicate how you want the files to be indexed. In the case of author files, it only makes sense to index them (Author Archives option, Enabled) if you have a blog with multiple authors. In this case, it also makes sense to show this information in search results, but only for those authors who have posts. If you’re the only writer on your blog, you’d better deactivate it or Google will consider you have duplicate content. You don’t want Google to penalize you. In the case of Date archives settings, it’s better to deactivate the indexing if we want, again, to avoid duplicate content. Leave them deactivated. And the Special Pages section refers to the search results page and the 404 error page. You can use the default settings. Breadcrumbs are links available on some websites, usually located under the main menu, that tell the user where they are on the web. 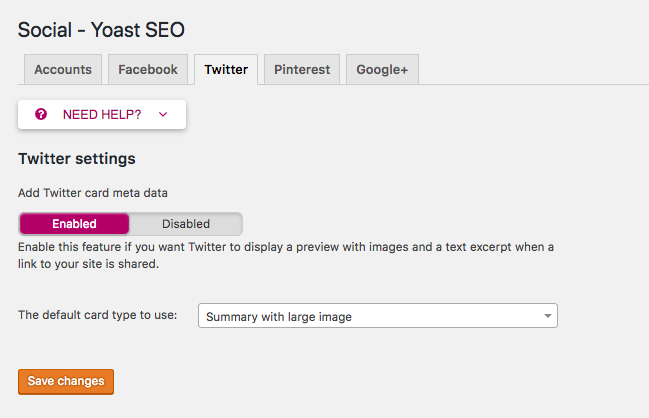 For example, for this post it would be: Home » blog » The perfect Yoast SEO Setup For Your WordPress (II). Showing or not these links is usually an option of the theme itself and it is more common to see it on websites of large corporations with many products or services or online stores. 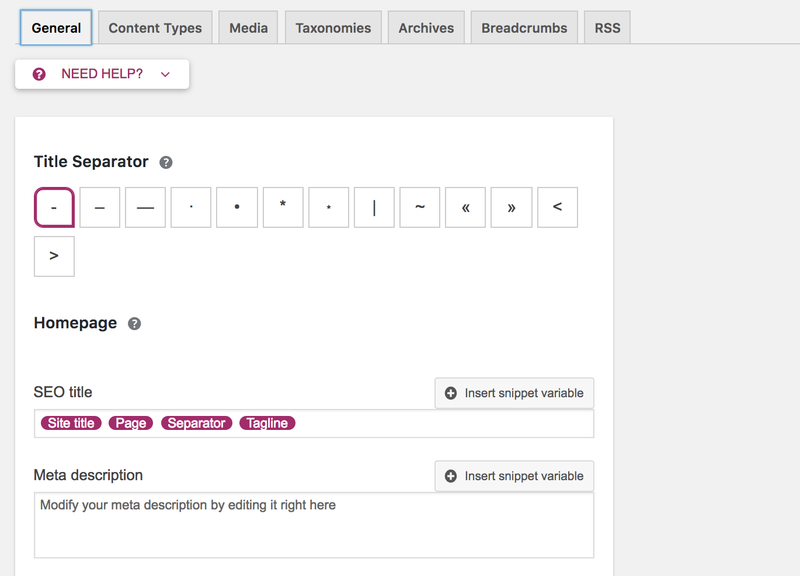 If you decide to activate them, Yoast will ask you for more information about how you want the breadcrumbs to be displayed: the breadcrumbs separator, the link text for the home page, etc. And the last tab within the Search Appearance option is RSS. RSS is a subscription system by which users can subscribe to our feeds and receive new content directly in their email or in the feeders they use to read RSS. In this way instead of visiting our website in search of news, they are informed in real time. Although it is not directly related to SEO, it is clear that it can bring traffic to your website. 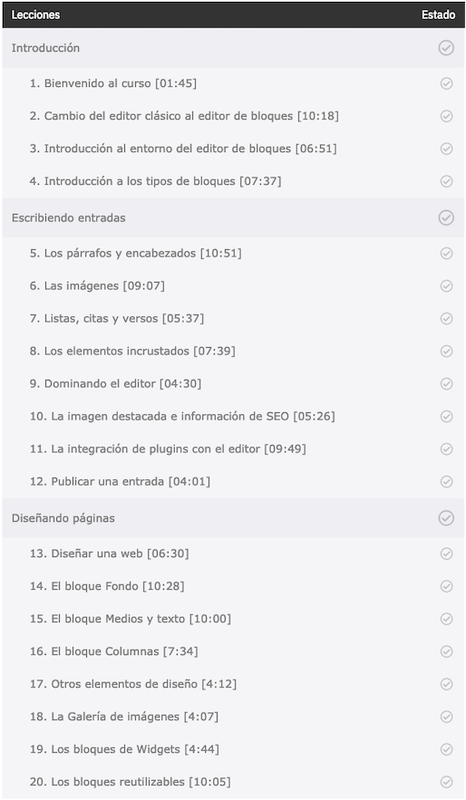 Ajustes del feed RSS en Yoast SEO. 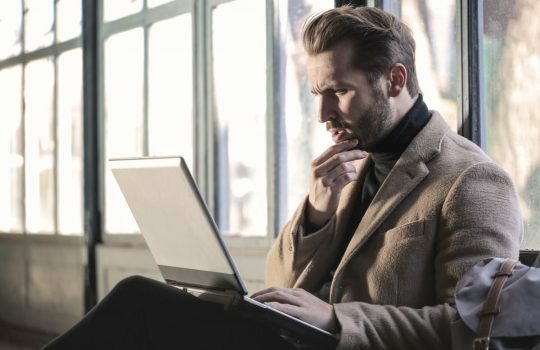 guarantees that, if a third party copies our content automatically from the RSS, the “copy” will contain a clear statement about the authorship of the content and a link to the original source. 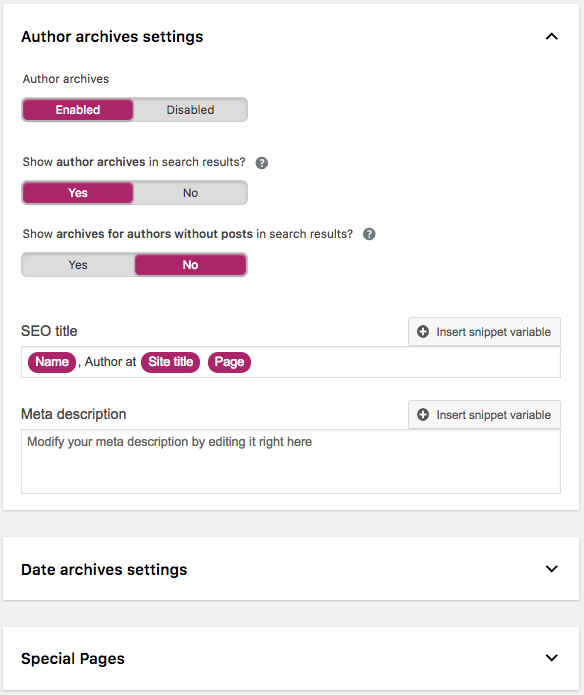 And so far, the first two menu options of the Yoast SEO plugin. If you want to become an expert, don’t miss the next post on Yoast SEO Configuration!